As 2018 draws to a close, it’s natural to become a bit nostalgic when reflecting on the exciting auto shows that took place around the world over the last 12 months. Dozens of new cars, trucks and SUVs made their world debuts, with many of them now either already on the road or coming to a showroom soon. After attending shows in Detroit, Geneva, New York, Paris and other locations around the globe, we present this retrospective of the most significant vehicle premieres at major auto shows during 2018. The redesigned 2019 Acura RDX made its world debut in New York, touting a lighter yet stiffer body and a new chassis. 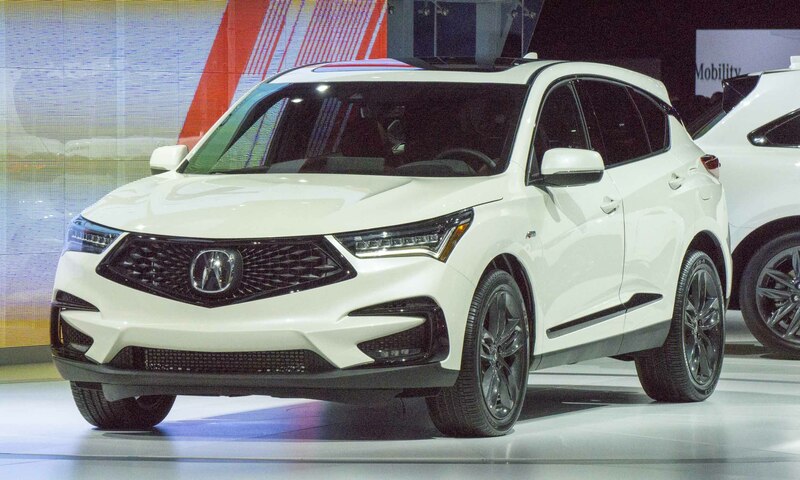 The RDX incorporates new Acura design language revealed with the Acura Precision Concept, adapting the low, wide, sleek look to a 5-occupant SUV with a wider track and longer wheelbase than its predecessor. The prominent Acura Diamond Pentagon Grille is flanked by new Jewel Eye headlights that now include seven LED lighting elements. Power for the 2019 Acura RDX comes from a new VTEC Turbo 2.0-liter direct-injection engine that produces 272 horsepower and 280 lb-ft of torque, connected to a 10-speed automatic transmission. The new Super-Handling All-Wheel Drive system includes a new rear differential that can deliver up to 70 percent of the torque to the rear axle. Acura’s SH-AWD uses dynamic torque vectoring to sharpen performance and handling all weather and road conditions. 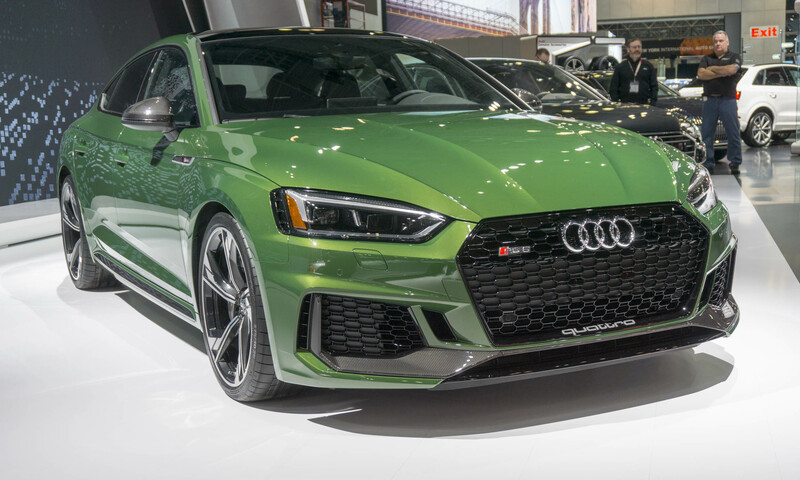 The latest member of Audi’s high-performance lineup, the RS 5 Sportback made its debut at this year’s show in the Big Apple. With styling similar to the larger RS 7, the RS 5 offers a roomy interior and the added versatility of a fastback design teamed with the extreme performance associated with Audi’s RS variants. The RS 5 gets a new 2.9-liter biturbo V6 engine that produces 444 horsepower and 443 lb-ft of torque available at a low 1900 rpm. With the additional grip of the RS 5’s standard quattro all-wheel drive, the result is some outstanding performance figures: zero to 60 mph in less than 4 seconds, with a top speed listed at 174 mph when equipped with the optional Dynamic Plus package. The RS 5 sets itself apart from the A5 and S5 models with a large, flat Singleframe grille, unique honeycomb air intakes, high-gloss black side sills, and matte alu-optic front spoiler and mirrors. With room for up to five with plenty of space for luggage, the RS 5 is an excellent everyday high-performance car. 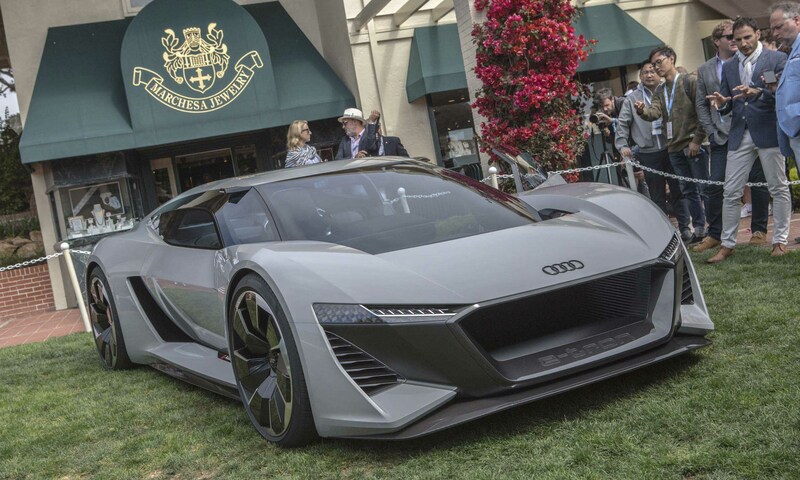 A high-performance concept car that focuses on the driver, the Audi PB 18 e-tron gives hope to driving enthusiasts who worry that in the future all cars will be autonomous. With a name derived from the mystique of the Pebble Beach debut location and from the Audi R18 e-tron LMP1 race car, the PB 18 e-tron is powered by three electric motors with quattro all-wheel drive. One electric motor is located in the front to drive the front wheels, and the other two motors power each rear wheel. With a total system output of 670 horsepower, Audi expects the PB 18 e-tron would accelerate from zero to 60 mph in a bit over 2 seconds. One of the most unique aspects of the Audi PB 18 e-tron is the central driving position. For performance driving, the pilot sits in the center of the car for better weight distribution and visibility. But when needed, the driver’s seat and all necessary driving controls can be moved to the left to create room for a passenger. A premium 5-seat midsize SUV, the Audi e-tron is the automaker’s first all-electric series production vehicle, with a design that is both stylish and aerodynamic with a uniquely enclosed grille. Audi e-tron is propelled by two power powerful electric motors — one powering each axle — and a new generation of quattro electric all-wheel drive that varies the amount of torque delivered to each axle for ideal balance according to driving conditions. Audi says e-tron will accelerate from zero to 60 mph in 5.5 seconds with a top speed of 124 mph. 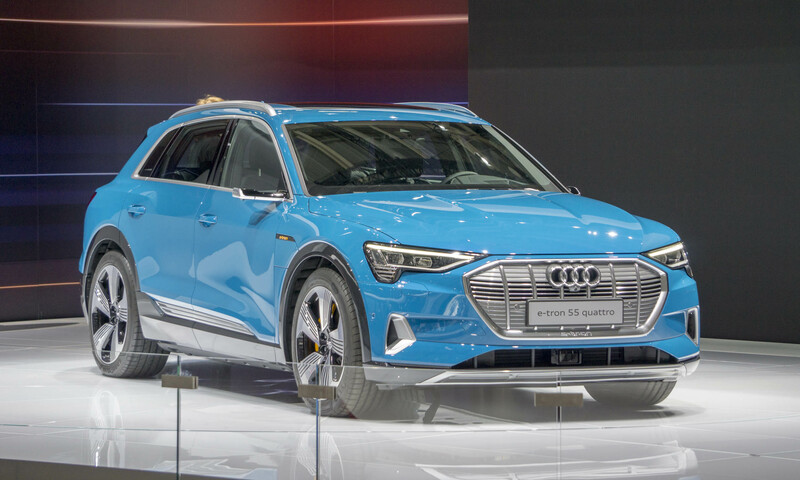 The battery system of the Audi e-tron is positioned low and central for sporty driving dynamics, and the 95 kWh of storage capacity will provide a long driving range. The e-tron recovers energy through its electric motors in combination with an electrohydraulic brake control system. Audi is the first manufacturer to use this type of system in an electric series production vehicle. The e-tron is scheduled to go on sale in European markets in late 2018; U.S. customers can configure their e-tron and place a reservation now with a refundable $1,000 fee. The first U.S. sales deliveries are expected in mid-2019. The German car company continued its march toward producing fully-electric vehicles with the introduction of its latest e-Tron model, the e-Tron GT. This stunning, low-slung four door possesses sleek styling, thanks in part to its flat-floor architecture and further emphasized by captivating 22-inch wheels. 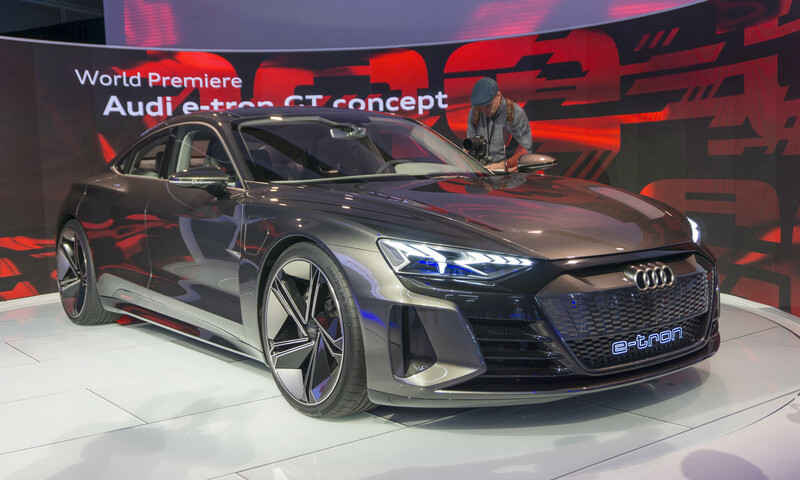 Looking a bit like a futuristic A7, the GT is adorned with the familiar Audi Singleframe grille as well as large air inlets that cool the battery and brakes. The e-Tron GT will have power appropriate to its sporty styling. Twin electric motors — one powering each axle — combine to generate a plentiful 590 horsepower. Audi expects that the production version would be able to sprint to 62 mph in 3.5 seconds, and 124 mph would come up in around 12 seconds, with an eventual top speed limited to almost 150 mph. The GT should be able to travel up to 249 miles between charges. The e-Tron GT is expected to go into production in late 2020, following the e-Tron SUV and e-Tron Sportback. 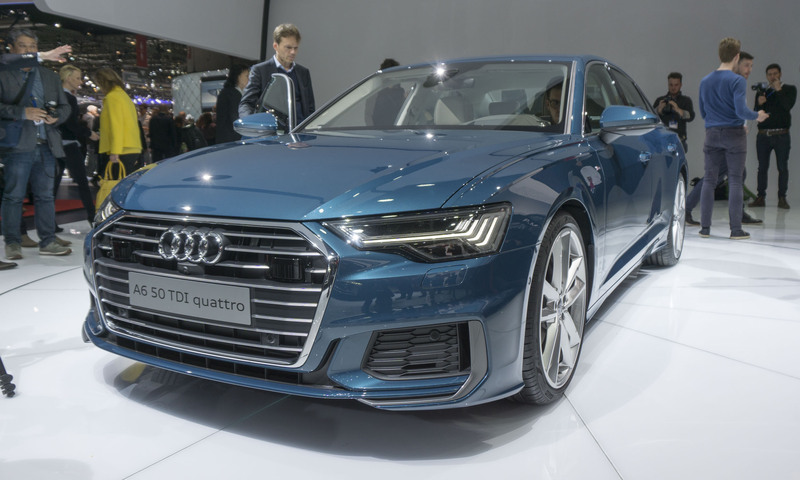 On display in Geneva was the new eighth-generation Audi A6, with a new design, technical innovations and mild hybrid engines. Following the new A8 and A7 Sportback models, the 2019 A6 adopts Audi’s new design direction with taut surfaces, more prominent edges and distinct body lines. The newest version of the hexagonal grille is flanked by new headlights offered in three different versions, with the top-line HD Matrix LED headlights with five horizontal lines that form the daytime running lights. Inside the A6 features a sleek instrument panel with a horizontal design, as well as a center console and MMI display directed toward the driver. A mild hybrid system includes a belt alternator starter and a lithium-ion battery that recovers up to 12 kW of energy during deceleration. The new suspension is designed to be sportier than the previous model but with a comfortable ride on the highway, and dynamic all-wheel steering contributes to direct steering response and stability. A wide range of driver assistance systems are offered and —depending on the options — the central driver assistance controller processes data from up to five radar sensors, five cameras, 12 ultrasonic sensors and a laser scanner. Aston Martin introduced the Valkyrie extreme hypercar last year. With a radical design and a massive 1100 horsepower, the Valkyrie can be described as being the closest thing to a street-legal Formula One race car. So how do you make a vehicle like this even more extreme? 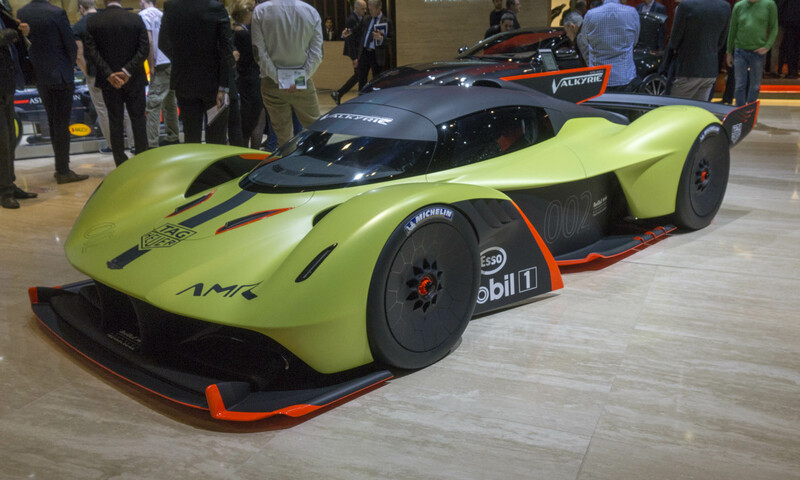 Turn it into a full-on track-only race car, which is exactly what Aston Martin has done with the introduction of the Valkyrie AMR Pro. Not all technical details have been released about the AMR Pro, but with a combination of improved aerodynamics and lighter-weight construction, the Valkyrie weighs less than 2,200 pounds and can generate more than that in downforce. The AMR PRO’s 6.5-liter V12 engine generates more than 1100 horsepower, which is more than 1 horsepower per kilogram of mass. This means the car can reach 225 mph and can achieve more than 3 Gs in corners. A mere 25 Aston Martin Valkyrie AMR Pros will be built, with deliveries expected to commence in 2020. All cars have already been sold. Bentley showcased the all-new Bentayga Hybrid at the Geneva Motor Show. 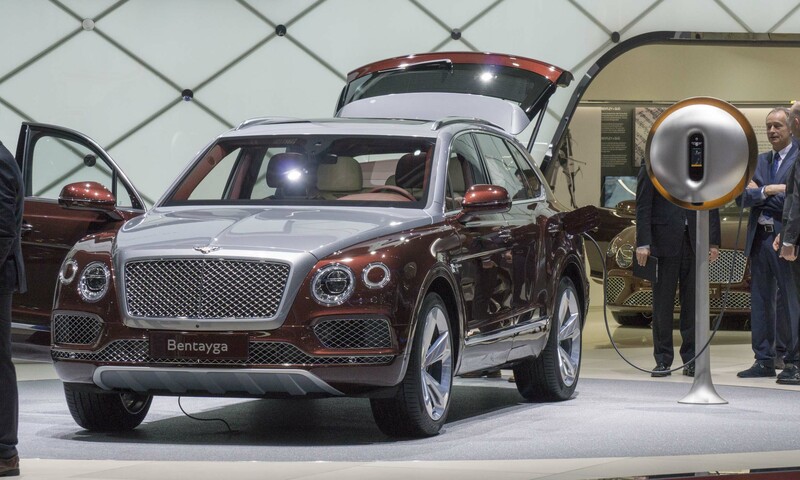 Bentley’s first hybrid-electric vehicle, the Bentayga Hybrid is a plug-in version combining a new turbocharged V6 gasoline engine with an advanced electric motor that works as both a motor and a generator as part of the hybrid system. According to Bentley, the electric-only driving range is more than 31 miles, and the battery can be recharged in 7.5 hours with a standard home outlet or 2.5 hours with a high-capacity outlet. The Bentayga Hybrid stands out with copper-colored badges on the lower front doors and the tailgate; a copper finish for the wheel centers and Bentley badges; and “Hybrid” on the door sill plates. The driver selects from three modes: EV Drive, Hybrid and Hold. The Driver’s Information Panel displays E Motion information regarding performance, consumption and energy source, while the infotainment screen displays energy flow for each of the E Modes. 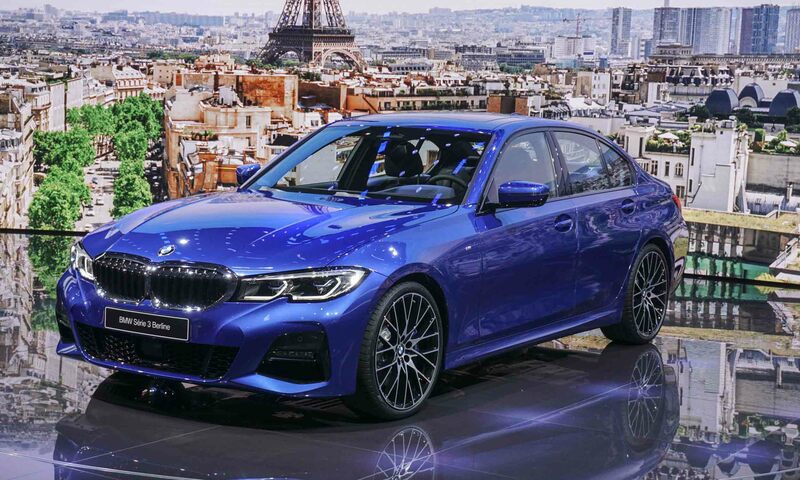 BMW unveiled the seventh generation of its best-selling 3 Series at the 2018 Mondial de l’Auto in Paris. For decades this iconic sport sedan has been the benchmark against which all other sport sedans are measured, and the next generation builds on that success with a striking new design and larger dimensions. The 2019 BMW 330i and 330i xDrive all-wheel drive are powered by an upgraded TwinPower 2.0-liter turbocharged 4-cylinder engine producing 255 horsepower and 295 lb-ft of torque. The BMW 330e iPerformance plug-in hybrid will arrive in early 2020. The BMW M430i and M430i xDrive will be added in spring 2019, powered by a new inline 6-cylinder engine with M Performance chassis tuning, xDrive intelligent all-wheel drive and a standard M Sport rear differential. The new M Performance variant will be powered by a new turbocharged inline 6-cylinder engine producing 382 horsepower and 369 lb-ft of torque, with acceleration from zero to 60 mph estimated at 4.2 seconds. 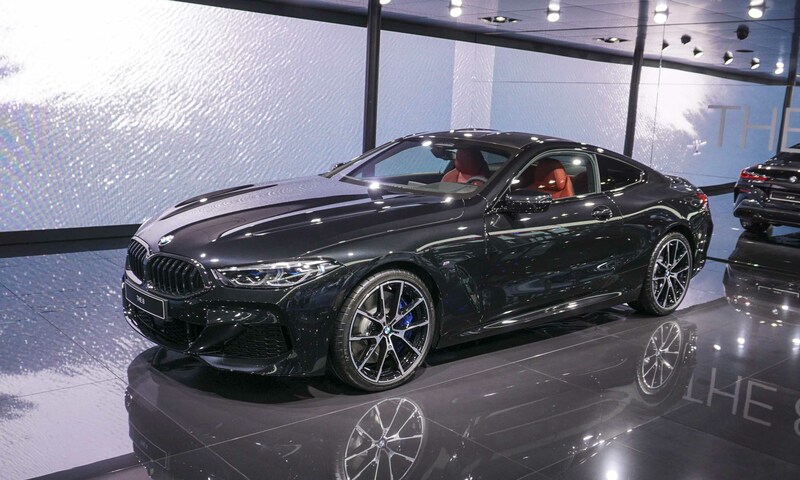 BMW’s all-new 8 Series Coupe was developed parallel to the BMW M8 GTE race car that competes in the FIA World Endurance Championship and the IMSA WeatherTech SportsCar Championship. The 8 Series makes its return to the U.S. market after 20 years and will initially be available as the BMW M850i xDrive, powered by a new TwinPower Turbo V8 engine combined with an 8-speed Steptronic Sport transmission and xDrive intelligent all-wheel drive with an electronic differential lock. The new 4.4-liter TwinPower V8 engine produces 523 horsepower and 553 lb-ft of torque — enough oomph to accelerate the M850i xDrive to 60 mph in 3.6 seconds with top speed limited to 155 mph. The 8 Series features a low profile, long silhouette, slim window pillars, double-bubble roof, optional carbon fiber roof and a long, flat rear window. The sculpted design has new signature headlights and the details optimize aerodynamics and weight. The interior is driver focused with a wide center console rising up to the instrument panel. Merino Individual leather and folding rear seats are standard. The production version of the BMW X7 made its world debut at the 2018 Los Angeles Auto Show, following the X7 Concept that was shown at last year’s venue. The largest BMW Sports Activity Vehicle, the all-new X7 offers standard 3-row seating for seven occupants with optional second-row captain’s chairs for a 6-person configuration. The X7 xDrive40i is powered by a turbocharged 3.0-liter inline 6-cylinder engine producing 335 horsepower and 330 lb-ft of torque, while the xDrive50i receives a new twin-turbocharged 4.4-liter V8 engine producing 456 horsepower and 479 lb-ft of torque. Both engines are paired with a new 8-speed Steptronic automatic transmission that can adapt shift strategy to the route and driving conditions by analyzing data from the optional Adaptive Cruise Control radar sensor. BMW X7 xDrive40i will start at $73,900 and the X7 xDrive50i is a bit higher, starting at $92,600. 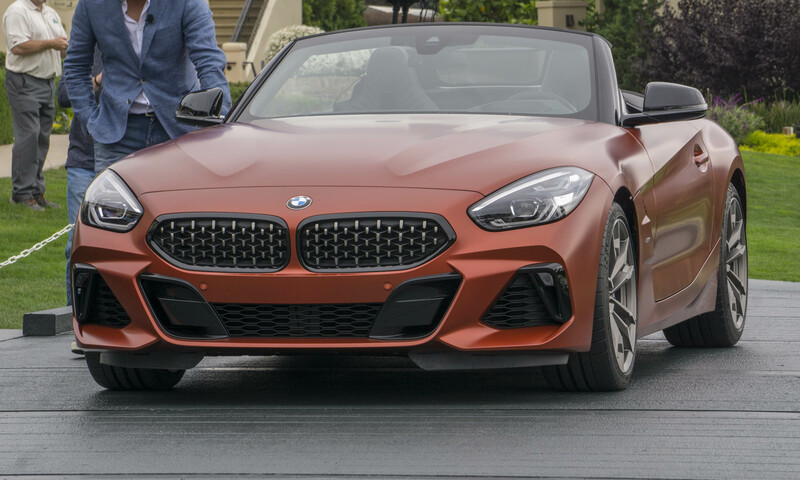 BMW premiered the Concept Z4 at the awards ramp prior to the 2017 Pebble Beach Concours d’Elegance with the promise that a production Z4 would be coming soon. This year on the same spot BMW kept that promise with the introduction of the all-new BMW Z4 roadster. The Z4 may be all new, but it is easily recognizable as a BMW. From the classic kidney grille to the long clamshell hood stretched over bold wheel arches to the short trunk lid, this new Z4 has all the lines of a classic BMW roadster. The sculpted hood, air vents behind the wheels and dual exhaust add to the sporting look of the new Z4. Not only does the new car look quick, it should have the power to back up that sporty styling. The Z4 sDrive30i will sport a 2.0-liter turbocharged engine producing 255 horsepower, while the Z4 M40i will get a 3.0-liter turbocharge 6-cylinder engine that puts out a plentiful 382 horsepower. The M40i is expected to reach 60 mph in a mere 4.4 seconds. 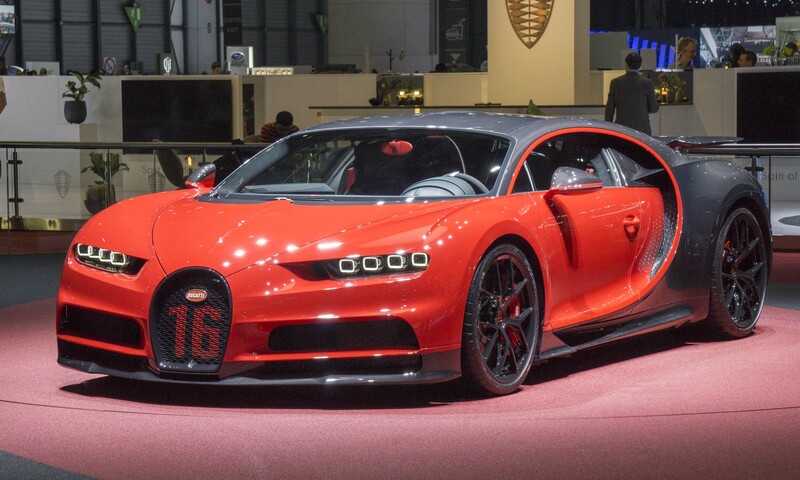 The new Bugatti Chiron is already one of the most extreme sports cars available, but in Geneva the company revealed an even higher-performance Chiron — the Chiron Sport. The Sport gets the same powerplant as the “regular” Chiron: an 8.0-liter quad-turbo W16 engine producing 1500 horsepower and an insane 1180 lb-ft of torque, available as low as 2000 rpm. The Sport features a dynamic handling package that provides a stiffer suspension and torque vectoring while reducing weight by around 40 pounds. In an effort to reduce weight to every last ounce, the Chiron Sport has carbon fiber windshield wipers — the first time carbon fiber has been used on wipers for a production car. Acceleration figures haven’t changed — the Chiron Sport still sprints to 62 mph in less than 2.5 seconds and 124 mph in around 6.5 seconds with a top speed of 261 mph. The primary advantage of the Sport is improved handling and much greater agility. According to Bugatti, the Chiron Sport was able to complete a lap of the Nardo handling circuit 5 seconds faster than the standard Chiron. The price for the Chiron Sport in America has been set at $3.26 million. When it comes to the ultimate extreme sports car on the planet, most auto aficionados will think of the Bugatti Chiron. With enormous power and a top speed north of 260 mph, this car resides at a different level than practically any other. However, Bugatti felt it could make a special version that would not only be more exclusive but also offer better handling and performance. 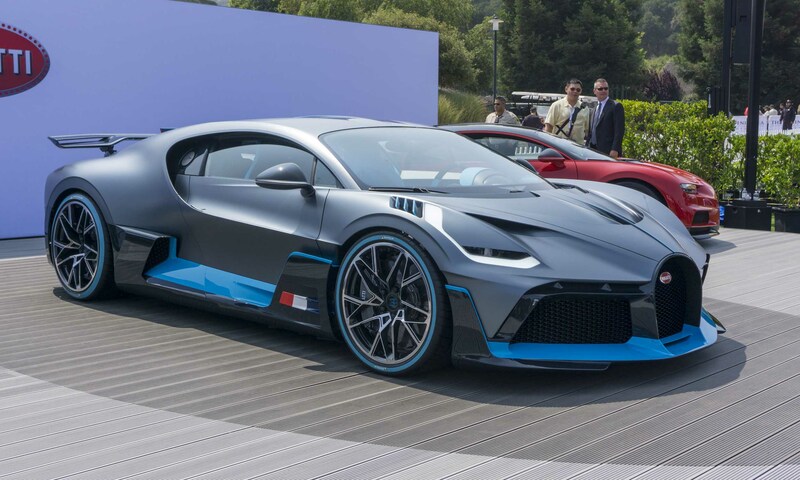 Introducing the Bugatti Divo, which made its world debut this summer in Pebble Beach. Design changes that differentiate Divo from Chiron are primarily functional, all with the goal of improving agility and performance. The newly-designed wider front spoiler provides higher downforce as well as more airflow, which improves overall cooling. The roof of the Divo has been shaped to direct air into the engine to manage operating temperatures. Bugatti engineers have also adjusted the steering and suspension for more direct response and sportier driving. While power and acceleration figures remain the same as the Chiron, the Divo is able to lap the Nardo handling circuit a full 8 seconds faster than the Chiron. 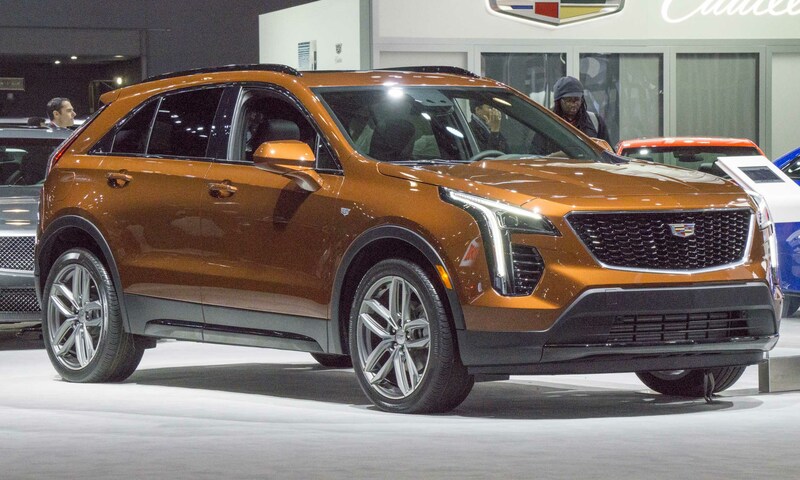 Cadillac’s new compact luxury crossover made its debut in the Big Apple, featuring an exterior design with clean, sculpted lines and an appealing interior design with integrated technologies. The 2019 Cadillac XT4 will be offered in three trim levels: Luxury, Premium Luxury and Sport. Each trim offers unique styling cues and finishes that appeal to owner preferences. The XT4 Sport has a more aggressive, performance-oriented look, while the Luxury and Premium Luxury trims have a more sophisticated flair including bright metallic grille accents and satin aluminum window trim. All levels of the XT4 include LED lighting technology for both low- and high-beam headlights, as well as LED light blades for daytime running lights. At the rear, all trims include standard LED taillights with tinted clear lenses for Sport. The XT4 is powered by an all-new turbocharged 2.0-liter 4-cylinder engine producing 237 horsepower and 258 lb-ft of torque, combined with a 9-speed automatic transmission. A twin-clutch all-wheel-drive system is offered with the option to disengage the rear wheels for more efficient operation. The all-new 2019 Chevrolet Silverado features bold styling, more configurations, multiple engine choices and a variety of trim levels. Even with a longer wheelbase, more passenger room and additional cargo volume, the next-generation Silverado weighs in 450 pounds lighter than the current model thanks to mixed materials and mass reduction expertise. 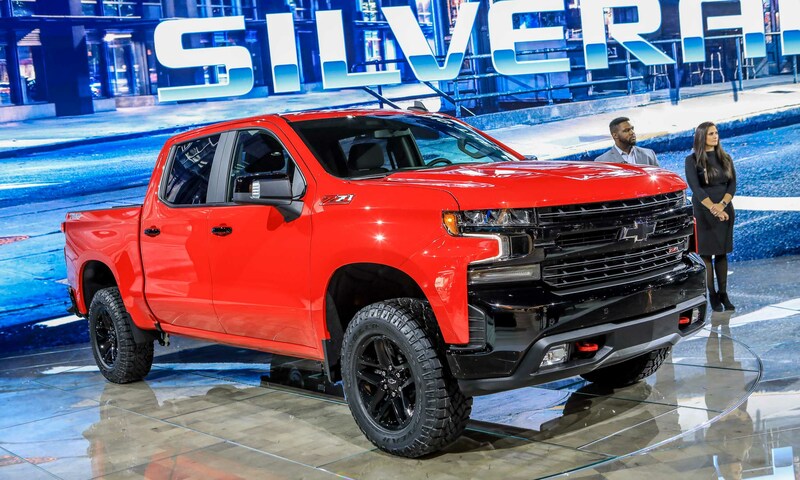 Silverado is available with six different engine / transmission combinations, including two new V8s — a 5.3-liter and a 6.2-liter — which offer Dynamic Fuel Management that deactivates cylinders when not needed. A new 3.0-liter diesel Duramax engine will also be available. Silverado’s new design incorporates a big grille with sleek, narrow headlights and LED accent lights below. The truck’s interior is completely updated with more space as well as redesigned control buttons and knobs. Eight trims are offered, including a new Trailboss version designed for off-roading, so it has a 2-inch suspension lift, big off-road tires and a complete off-road package. 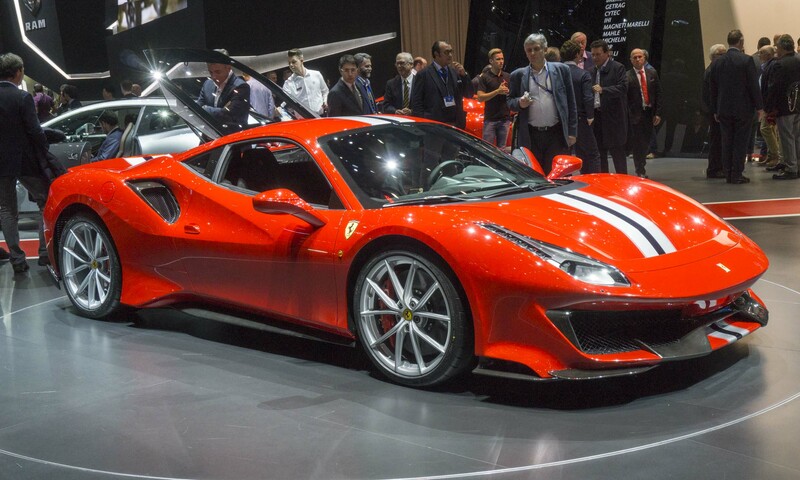 The legendary Italian carmaker has taken its already-powerful 488 GTB and turned it into a race-ready machine. The new 488 Pista — which means “track” in Italian — gets aero improvements that include an S-Duct at the front, new diffusers and a new rear spoiler, resulting in a 20 percent boost in efficiency versus the 488 GTB. In addition to better aerodynamics, the Pista features a lithium battery and new carbon fiber wheels. These tweaks contribute to an overall weight savings of almost 200 pounds. The Pista receives further enhancement via the most powerful V8 engine ever from Ferrari. The standard 660 horsepower in the 488 GTB gets pumped to almost 710 horsepower thanks to the Pista’s 3.9-liter turbocharged V8. Power transfers to the rear wheels via an F1 7-speed dual-clutch gearbox. As expected, performance figures are impressive: 62 mph arrives in 2.85 seconds and 124 mph is eclipsed in 7.6 seconds, with a top speed of more than 210 mph. 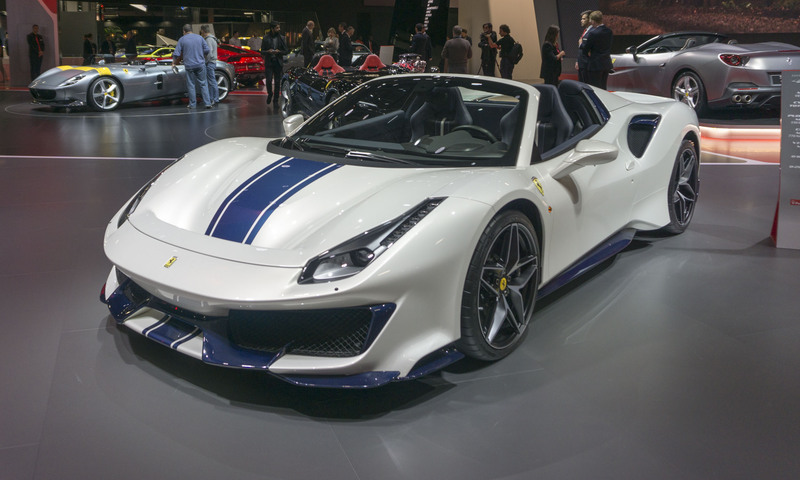 After introducing the high-performance 488 Pista at the Geneva Motor Show earlier this year, Ferrari chose Paris to take the wraps off the open-top version — the 488 Pista Spider. The Pista Spider joins a long line of Ferraris that puts the wind through a driver’s hair at a high rate of speed; in fact, this is the 50th drop-top model from the legendary Italian car company. The Pista gets aero improvements that include an S-Duct at the front, new diffusers and a new rear spoiler, resulting in a 25 percent increase in downforce compared to the standard 488 Spider. The Pista receives further enhancement via the most powerful V8 engine ever from Ferrari. The standard 660 horsepower in the 488 GTB gets pumped to almost 710 horses thanks to the Pista’s 3.9-liter turbocharged V8. With this much power, Ferrari says this is most powerful series production spider in the brand’s storied history. Power is sent to the rear wheels via an F1 7-speed dual-clutch gearbox. The open-top Pista is just as quick and fast as its hardtop sibling, with the ability to put a 210-mph breeze through the driver’s hair. At this year’s Paris Motor Show, Ferrari announced a new series of special models called Icona. Unlike previous special editions, the Icona series will feature models inspired by the most exciting Ferraris of the 1950s, but they will be decked out with the most advanced sports car technology — a fitting blend of old and new. 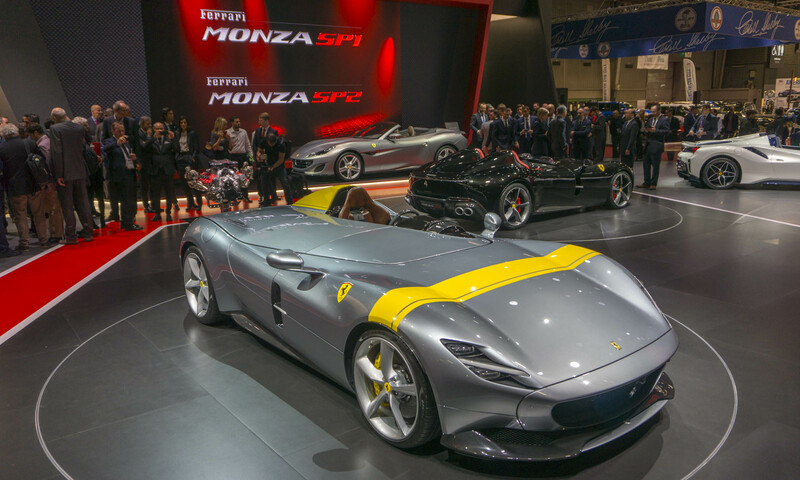 The first models in this new Icona series will be the Monza SP1 and Monza SP2 —intended to honor iconic Ferrari racing barchettas such as the 1948 166 MM, which originally inspired the name barchetta — which means “little boat” in Italian — as well as the 750 Monza and 860 Monza. Designed as a single-seat road car, the Monza SP1 offers a truly unique Ferrari experience for the street. The tonneau cover over the passenger area is reminiscent of similarly-equipped Ferrari race cars from the 50s, which used the cover to improve aerodynamics when the passenger seat was not occupied. The Monza SP2 has the same basic styling as the SP1. However, thanks to the elimination of the tonneau cover and the addition of a second protective screen, this car is a two-seater. Both are motivated by the most powerful V12 engine to ever come from Ferrari: a 6.5-liter V12 monster that produces almost 800 horsepower. Pricing for these limited-edition Ferraris was not announced, but a tag well over $1 million should not be considered hyperbole — and it’s likely that they’re already sold out. Previous high-performance ST variants have been offered for Focus and Fiesta, but the rollout of the 2019 Edge ST is the Ford Performance team’s first application of the ST treatment to an SUV. Powered by a 2.7-liter twin-turbocharged EcoBoost engine producing 335 horsepower and 380 lb-ft of torque, the Edge ST also features an 8-speed automatic transmission, standard all-wheel drive with selectable traction control, ST-tuned suspension and an available performance brake package. A new Sport mode offers more aggressive throttle response, revised shift mapping that will hold gears longer, and a more resonant exhaust note. This high-performance crossover looks the part with a bolder look that features a wide mesh grille, revised front fascia, a new rear styling, side skirts, dual exhaust outlets and standard 20-inch wheels, with 21-inchers optional. Inside, the Edge ST is outfitted with contoured ST sport seats, steering-wheel mounted paddle shifters, ST badging on the steering wheel, ST logos on the seatbacks and Ford Performance scuff plates. To car and movie buffs alike, Steve McQueen at the wheel of a 1968 Ford Mustang GT pursuing a Dodge Charger through the streets of San Francisco remains one of the best chase scenes ever put to film. The iconic sequence from “Bullitt” was shot 50 years ago, and to commemorate that anniversary Ford introduced an all-new 2019 Mustang Bullitt in Detroit. 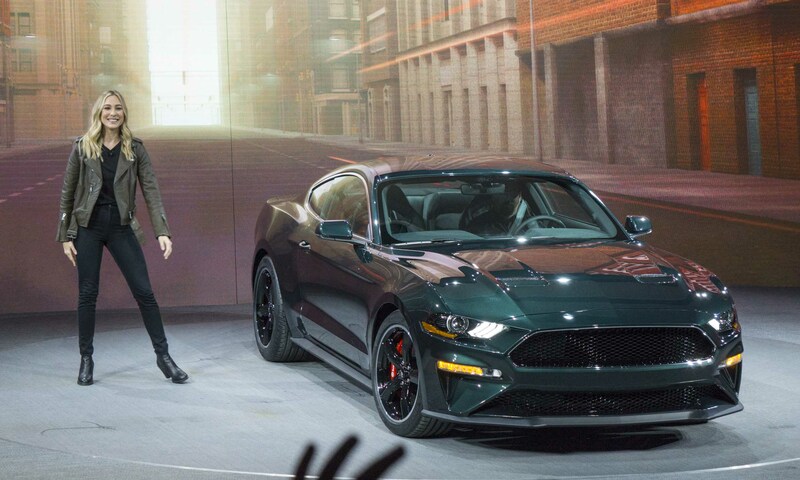 And to the delight of attending journalists, the new Mustang Bullitt was unveiled during Ford’s press conference by Molly McQueen — Steve McQueen’s granddaughter. The 2019 Mustang Bullitt is a proper tribute to the original, swathed in classic Dark Highland Green paint and subtle chrome accents. The interior has a balanced mix of classic and modern touches with an all-digital LCD instrument cluster and available Recaro black leather seats with green accent stitching. The nostalgic Mustang boasts an upgraded 5.0-liter V8 engine producing 480 horsepower, giving this Bullitt the capability to exceed 160 mph. In Detroit Ford celebrated the return of the Ranger as the Blue Oval’s reentry into the U.S. midsize pickup segment. The 2019 Ranger features a high-strength steel frame, a 2.3 -liter turbocharged EcoBoost engine and a 10-speed automatic transmission. The new pickup has a high beltline, a raked grille, a dual-dome hood, the Ranger name stamped in the tailgate, and short overhangs for better off-road clearance. Inside, the 2019 Ford Ranger offers seating for up to five, a center stack with an 8-inch touchscreen for the available SYNC3 system and dual LCD screens in the instrument cluster to display vehicle, navigation and audio information. 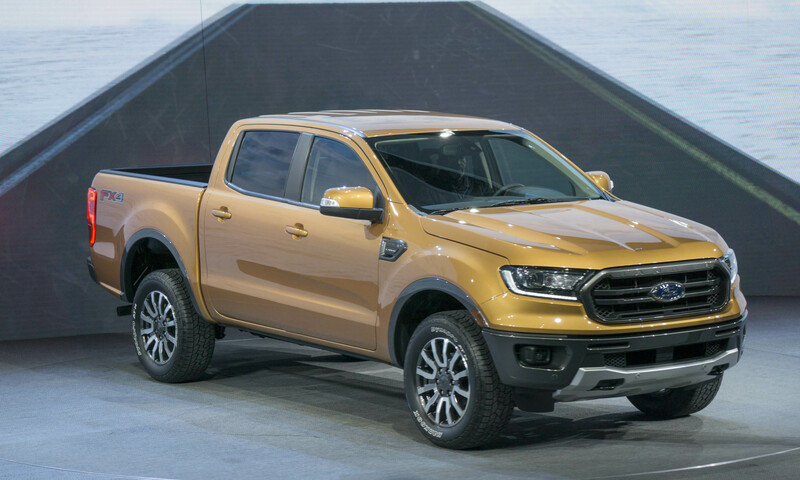 Even though Ranger is already sold in other markets around the world, the 2019 model in Detroit has been engineered specifically for the North American market, with production scheduled to begin in late 2018 and sales beginning in early 2019. 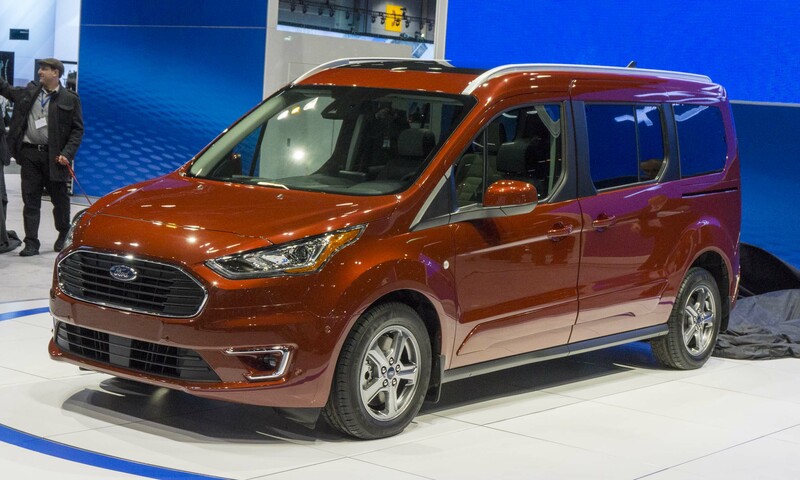 In Chicago Ford debuted the new 2019 Transit Connect Wagon — the passenger version of the compact Transit Connect van — available in both 5-passenger and 7-passenger configurations with two different wheelbases. Designed to accommodate owners who need to balance the needs of both passengers and cargo, the new Transit Connect Wagon offers dual sliding side doors and an interior that can be quickly configured for cargo hauling. 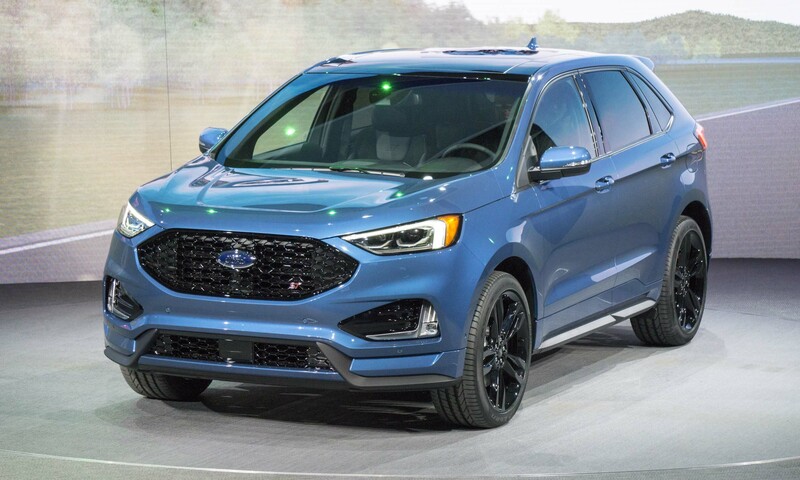 The design incorporates a new front fascia with a larger oval grille similar to other Ford models, and a shoulder line that rises toward the rear with a tapered window graphic. Two new engines for the Transit Connect Wagon include a standard 2.0-liter gasoline engine and an all-new 1.5-liter EcoBlue diesel, both combine with an 8-speed automatic transmission. The 1.5-liter EcoBlue is expected to achieve an EPA-estimated fuel economy rating of 30 mpg highway. Seven new driver-assist technologies include standard automatic emergency braking, pre-collision assist with pedestrian detection, an available blind-spot information system with cross-traffic alert and an available lane-keeping system. With stunning looks and a futuristic interior, the Essentia Concept was a favorite at the 2018 New York Auto Show. The Essentia is a pure electric vehicle with multiple motors that would drive all four wheels. Performance would match the sleek styling — it’s estimated that a vehicle such as this would be able to sprint to 60 mph in a mere 3 seconds. The Essentia’s silhouette emphasizes classic GT styling with its long, low hood and swept back cabin. Butterfly doors allow for easy ingress and egress. Inside Essentia, the front seats look like modern furniture, trimmed in cognac leather with herringbone quilting. Oxford Blue leather swathes the rear seats, while blue velvet trims the roof pillars. The gauges and other driving information gets displayed in front of the driver on an 8-inch widescreen. A larger display fills the entire dashboard, providing infotainment, climate, communication and other details for both driver and passenger. Currently the Essentia is only a concept vehicle with no production plans. However, Genesis will likely carry over some Essentia technology and styling cues to a future GT car that fits well within the Genesis brand. Genesis added a third entry to its growing lineup with the introduction of the all-new G70 sedan. Making its U.S. debut at the 2018 New York show, the G70 represents the first Genesis to play in the popular entry-level luxury market. 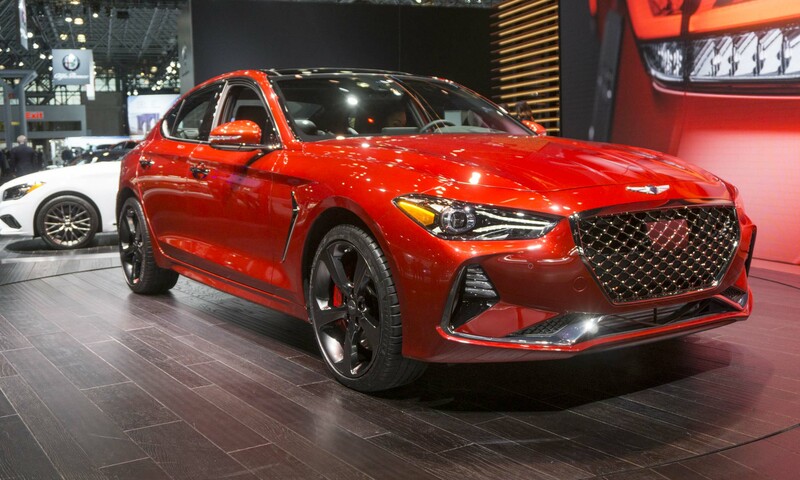 A sporty 4-door sedan, the G70 is available with a choice of powertrains: a 252-horsepower turbocharged 4-cylinder engine or a 3.3-liter twin-turbo V6 that produces 365 horsepower. Both powerplants can be teamed with rear- or all-wheel drive and — in a surprising move — Genesis is offering a 6-speed manual gearbox on the G70 with the 2.0-liter engine and rear-wheel drive. The interior is driver-oriented with Nappa leather and brushed-aluminum trim as well as premium soft-touch materials throughout the cabin. As with other Genesis models, the G70 is available with the latest in active and passive safety technology. Back in 1999, the Honda Insight was a small 2-seat hatchback that held the honor of being the first hybrid car ever sold in America. The Insight name was used on another hybrid model until a few years ago, and at this year’s New York show the latest hybrid to wear the Insight name made its world debut. This is the fifth electrified model in the Honda lineup, joining the Clarity series and Accord Hybrid. Positioned between the Civic and Accord, this latest Insight features more mainstream styling than the previous Insights. 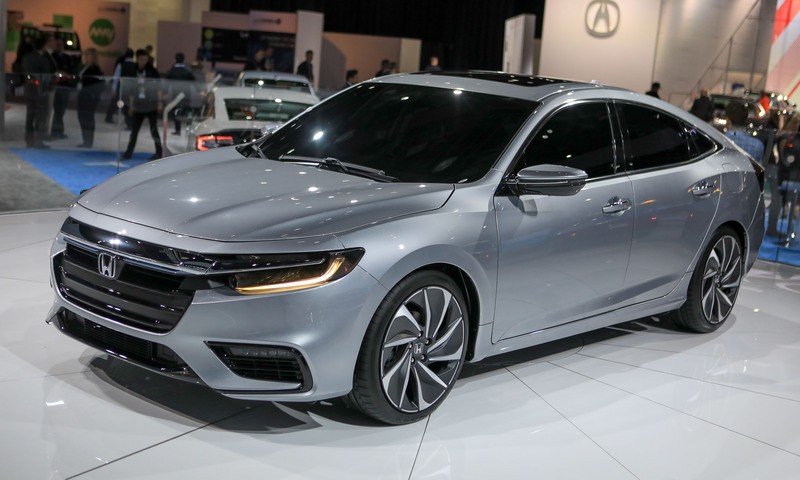 The new Insight is powered by a hybrid system consisting of a 1.5-liter Atkinson-cycle engine teamed with an electric motor delivering a total of 151 horsepower and 197 lb-ft of torque. Under most driving conditions, the gasoline engine produces electricity that drives the electric motors or charges the lithium-ion battery pack. When cruising at highway speeds, a lock-up clutch can connect the gas engine to the drive axle for more efficient operation. Fuel economy is impressive — according to the EPA the Insight is rated at 52 mpg combined. Honda recycles a familiar name, adding another SUV to its lineup between the compact CR-V and the three-row Pilot with the world debut of the all-new 5-seat Honda Passport. 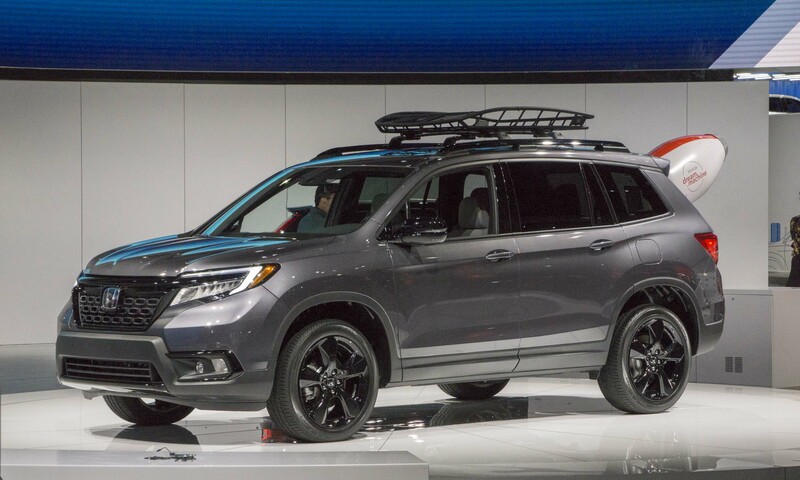 The all-new Honda Passport features a rugged exterior design with a matte-black grille, aggressive wheel arches, a floating roof design, increased ride height and standard 20-inch wheels. Passport will be offered in four trim levels: Sport, EX-L, Touring and Elite. Inside is a 7-inch TFT screen with a wide range of information and a multi-information display with customizable features. Passport EX-L, Touring and Elite trims feature Honda’s 8-inch Display Audio touchscreen system with Apple CarPlay and Android Auto smartphone integration. Scheduled to go on sale early in 2019, the Passport is powered by a 3.5-liter Honda i-VTEC V6 engine producing 280 horsepower and 262 lb-ft of torque, combined with Honda’s newest 9-speed automatic transmission. The available Intelligent Variable Torque Management torque-vectoring all-wheel drive and Intelligent Traction Management system optimize performance for varying surface conditions, improving performance in varying conditions and providing off-road capability. 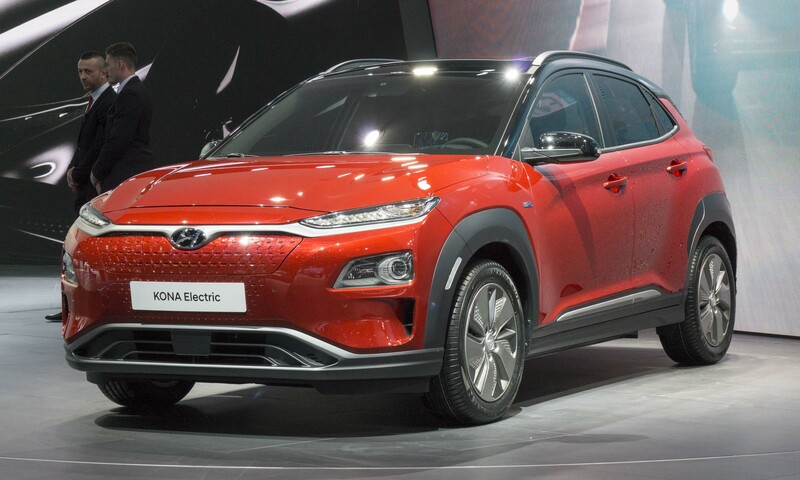 In the Big Apple Hyundai unveiled its first electric compact crossover for the U.S. market with the debut of the 2019 Kona Electric. Built on an all-new CUV platform, Kona Electric features a powerful yet efficient electric drivetrain and a comfortable, roomy interior with an estimated driving range on a full charge of 258 miles. The drivetrain features a 150-kW electric motor that produces 201 horsepower and 291 lb-ft of torque, and a high-voltage 64 kWh lithium-ion battery. According to the EPA, the Kona Electric is rated at 120 combined MPGe. Kona Electric utilizes a Level-II onboard charging system capable of a 7.2 kW rate of charge for rapid recharging. An 80 percent charge can be achieved in 54 minutes with a Level-III quick charge using the SAE-Combo charging port, while a 7.2 kW Level-II charger takes 9 hours and 35 minutes. The Kona Electric receives aerodynamic body enhancements and LED headlights, taillights and daytime running lights. 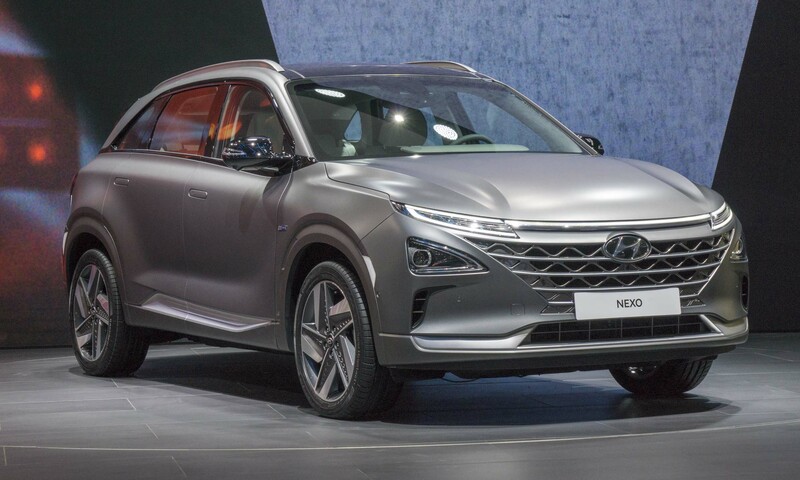 The latest fuel-cell offering from the Korean automaker graced the Hyundai stand in Geneva — the all-new NEXO. The second-generation of Hyundai’s commercial fuel-cell vehicle — the first was based on the Tucson — the NEXO is new from the ground up. Built as a 5-passenger crossover, NEXO features a stylish exterior with swept-back narrow headlights, flush door handles and a sleek roofline. The NEXO employs three separate hydrogen tanks which improve interior space as well as provide room for a large, flat cargo area. The electric motor in the NEXO generates 160 horsepower, enabling acceleration to 62 mph in about 9 seconds. Each of the three hydrogen fuel tanks can hold up to 52.2 liters, which is a much improved storage density over the previous generation fuel-cell vehicle. Even with the increased capacity, Hyundai claims it only takes about five minutes to refuel the NEXO. Once fully fueled, NEXO can travel up to 370 miles — about 105 miles farther than its predecessor. The new pinnacle of Hyundai’s SUV lineup, the 2020 Palisade is now the largest model offered by the Korean car company. With standard 8-occupant seating or optional second-row individual captain’s chairs, the Palisade provides 18 cubic feet of cargo capacity behind the third row and 45.8 cubic feet with the second row folded. The Hyundai Palisade features a bold, wide cascading grille flanked by separated composite headlights and a vertically-connected lighting signature with available LED headlights, LED daytime running lights and LED turn-signal mirrors. At the rear, vertical LED taillights evoke a sophisticated tone. The 2020 Hyundai Palisade is powered by a 3.8-liter V6 engine producing an estimated 291 horsepower and 262 lb-ft of torque. Offered with 2-wheel drive or with Hyundai’s HTRAC All-Wheel-Drive with new Snow mode, the 2020 Hyundai Palisade is scheduled to go on sale in the U.S. in summer 2019. 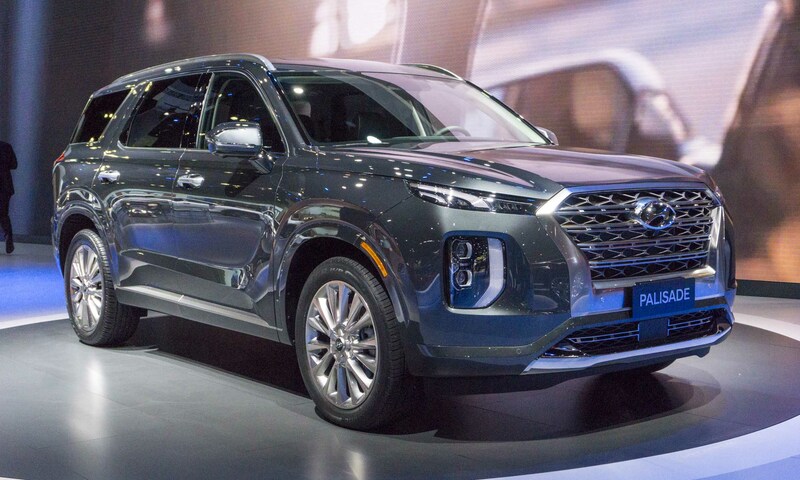 The redesigned 2019 Hyundai Santa Fe made its U.S. debut at the New York Auto Show, sporting a bolder grille with circular mesh, LED headlights, LED daytime running lights, more sculpted wheel openings, taillights connected by a bright trim strip and a more prominent rear spoiler. 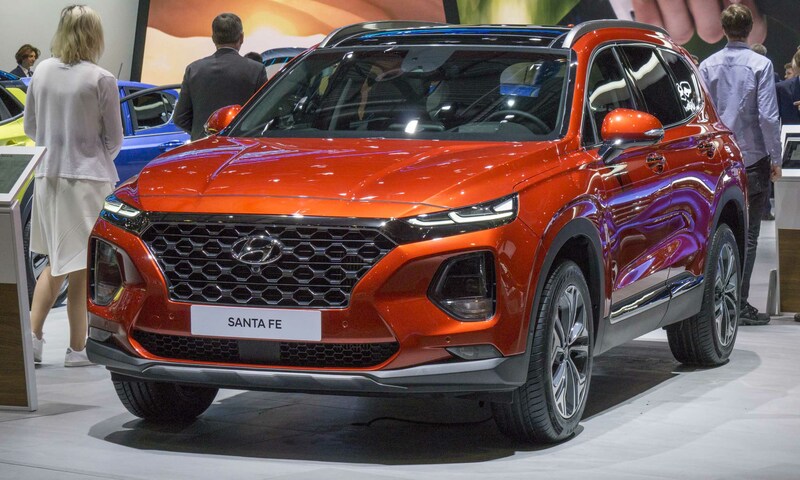 For 2019 Santa Fe will be the model name for the 5-seat version, dropping the Santa Fe Sport name used for the 2018 model, while the 7-seat version will now be known as the Santa Fe XL. The new Santa Fe is larger than the outgoing Santa Fe Sport with increased interior volume and a design that is more horizontal to emphasize space and visibility with a repositioned infotainment screen. Hyundai Smart Sense technologies are standard on the SE trim and above and include forward collision avoidance assist, blind-spot collision warning, lane-keeping assist, driver attention warning, smart cruise control with stop and go, rear view monitor with parking guidance, around view monitor and rear cross-traffic collision avoidance assist. 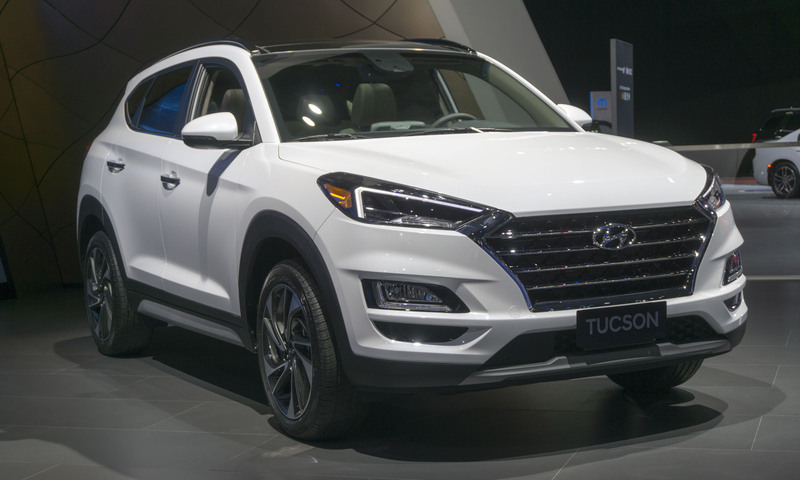 Hyundai introduced an all-new Tucson in New York with updated styling similar to the new Santa Fe. The 2019 Tucson is easily spotted with a new headlight design with LED daytime running lights, a new rear fascia, redesigned taillights, new 18-inch wheels for the SEL trim and redesigned 17- and 19-inch wheels for other trims. Inside, the Tucson receives a lot of new features, including the center stack, instrument cluster, leather seat design, vent design and rearview mirror. Forward collision-avoidance assist and lane-keeping assist are both standard. Additional available safety and technology features include forward collision-avoidance assist with pedestrian detection, high-beam assist, rain-sensing wipers, surround view monitor, smart cruise control with Stop-and-Go and Driver Attention Warning. A 7-inch display audio system is standard with Apple CarPlay and Android Auto. Blue Link Connected Car System with three years of complimentary Blue Link services is available starting with Value trim. 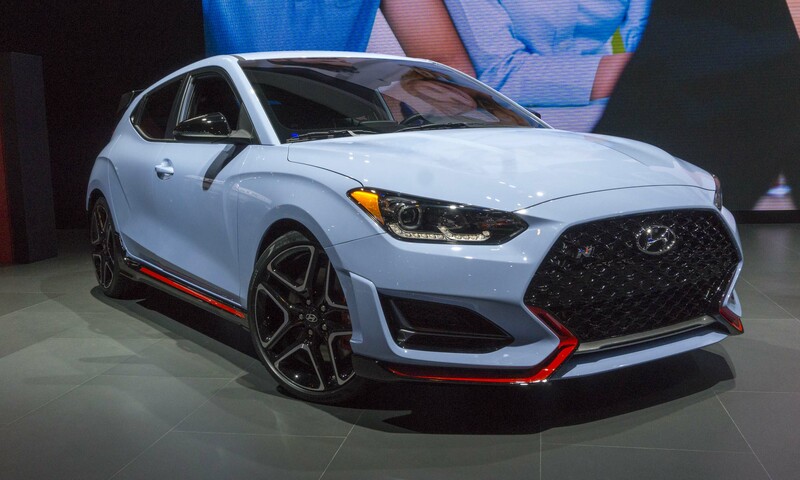 An all-new Veloster premiered last January during Hyundai’s press conference at the 2018 Detroit Auto Show. The sporty little car gets a refreshed design as well as other improvements, and Veloster retains its unique 3-door configuration: one on the driver’s side, two on the passenger side. 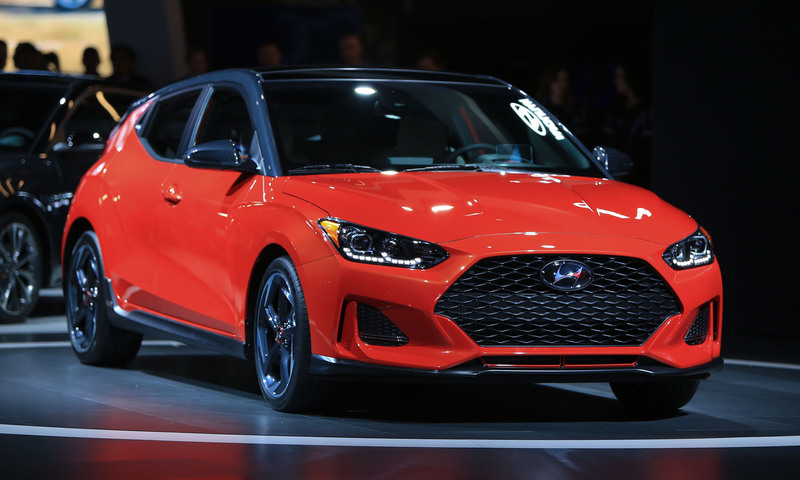 Veloster now sports a larger grille flanked by swept-back headlights, as well as bodywork that assists airflow around the wheels for better aerodynamics. Veloster’s silhouette is sleeker than the previous model, further emphasized by optional 18-inch alloy wheels. Multiple trims are available, including the new Turbo R Spec that boasts a turbocharged 1.6-liter engine producing 201 horsepower and 195 lb-ft of torque at a mere 1500 rpm. In Motown Hyundai also took the wraps off a high-performance Veloster N. This is the first of what could be several models in a new N lineup. The Veloster N differs from the standard version with a unique front fascia and grille, dedicated air ducts for enhanced brake cooling, side rocker sills, a rear spoiler, a dual exhaust and 19-inch lightweight alloy wheels. More than merely an appearance package, the Veloster N gets a larger 2.0-liter turbocharged engine generating 275 horsepower and 260 ft-lb of torque, teamed with a close-ratio 6-speed manual transmission. Over the last few years, Infiniti has shown several electrified concept vehicles as key components of its commitment to having its entire model lineup fully electrified by 2021, and the latest in this line of concepts debuted at the 2018 Paris Motor Show. 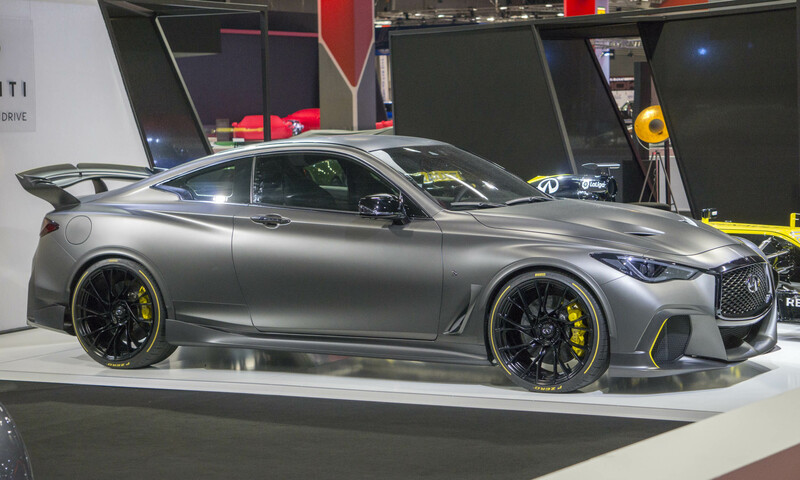 The Infiniti Project Black S prototype is based on the Q60 Red Sport 400 and employs a Formula One-inspired dual-hybrid powertrain to showcase how a high-performance hybrid system might work in a road car. The powertrain of the Infiniti Project Black S prototype uses three motor-generator units. One of these reclaims energy from braking, while the other two are connected with the engine’s twin electric turbochargers to harvest heat energy from exhaust gasses. In this way electrical power is generated under braking as well as acceleration. The unique dual-hybrid system in the Black S prototype recovers enough additional energy to bring the overall output of the powertrain to 563 horsepower — a significant jump compared to the 400-horsepower produced by the standard twin-turbo V6. Based on the power-to-weight ratio, Infiniti expects this sporty coupe to reach 62 mph in less than 4 seconds. 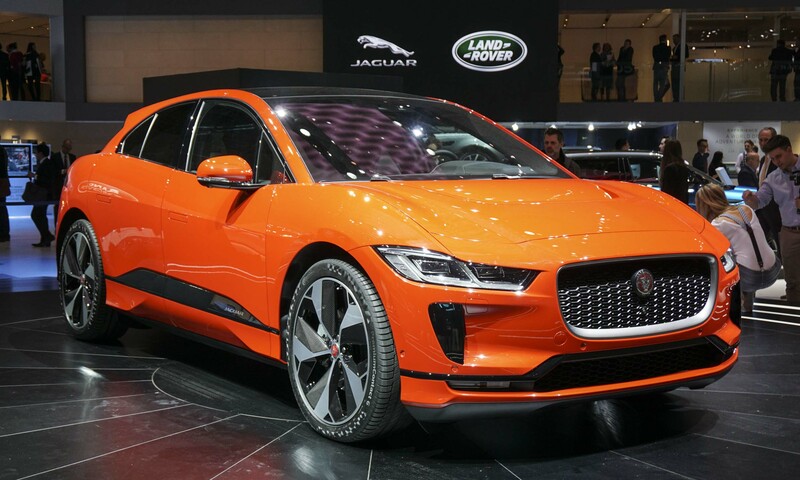 There has been much anticipation around a Jaguar electric vehicle since the I-PACE Concept debuted in 2016, and the all-electric 2019 Jaguar I-PACE that debuted during press days at the 2018 Geneva Motor Show does not disappoint. Built on a unique aluminum-intensive EV architecture that uses advanced riveting and bonding technology, the I-PACE features a light, stiff body structure with a 50:50 weight distribution. With a long 117.7-inch wheelbase and an overall length of 184.3 inches, the I-PACE has a similar footprint to the Jaguar F-PACE but offers the interior space of a larger vehicle, thanks to the EV architecture. The all-wheel-drive I-PACE is powered by two electric motors — one driving each axle — for a total output of 394 horsepower and 512 lb-ft of torque, which makes the I-PACE capable of accelerating from zero to 60 mph in 4.5 seconds. The driving range according to the EPA is listed at 234 miles on a full charge from its 90kWh lithium-ion battery. Owners will be able to charge the battery from zero to 80 percent capacity in about 40 minutes using publicly-available 100kW rapid charging facilities. The Jeep Cherokee gets a refreshed design for the 2019 model year — its first styling update since returning to the Jeep lineup as a 2014 model. Exterior changes include a more vertical 7-slot grille, a new fascia, a revised grille / headlight treatment and a lightweight aluminum hood. A turbocharged 2.0-liter engine is added, producing 270 horsepower and 295 lb-ft of torque. All engines have a new 9-speed automatic transmission as standard equipment. Inside, the new Jeep Cherokee receives subtle changes to lines and contours, with more premium materials improving quality and comfort. Interior trim includes Piano Black and Satin Chrome accents, soft-touch materials accentuate the door panels, and lighter colors on lower panels match seat colors. The standard Uconnect touchscreen increases to 7 inches and the optional Uconnect screen is 8.4-inches with Off-Road packages. The 2019 Jeep Cherokee is offered in five trim levels: Latitude Base, Latitude Plus, Trailhawk, Limited and Overland. 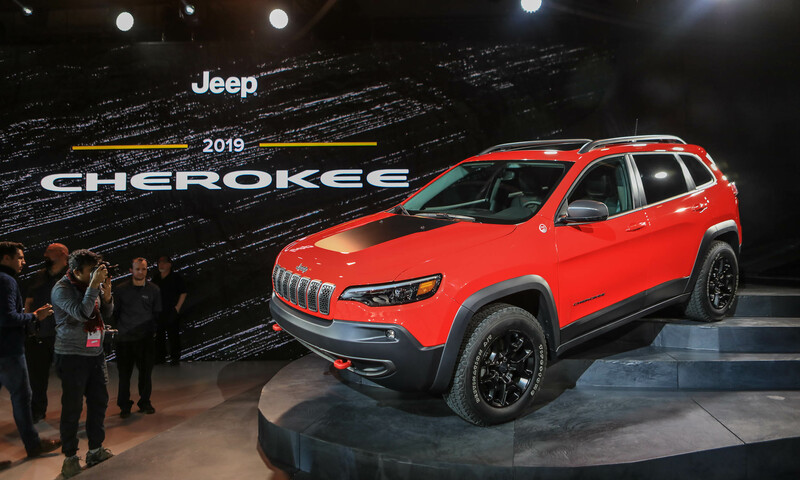 The Cherokee Trailhawk adds options and equipment to make it the most off-road-capable version, while the Limited and Overland add features for more luxury and refinement. There has been a lot of rumors, speculation and general chatter brewing about a Jeep pickup truck, perhaps since Jeep discontinued the Comanche pickup more than 25 years ago. Now all rumors can be put to rest — the Gladiator made its first appearance at this year’s Los Angeles Auto Show. 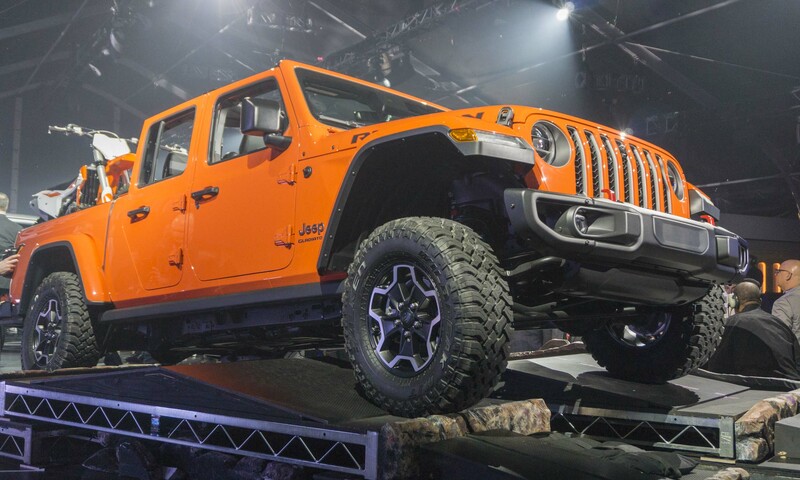 This highly-anticipated addition to the Jeep lineup is based on the all-new Wrangler and will bring a strong competitor to the growing midsize truck market. Given that the Gladiator is based on the Wrangler, the new truck will be a proper off-roader, able to handle up to 30 inches of water with 11.1 inches of ground clearance. All trims of the new Gladiator pickup will be initially equipped with a 3.6-liter Pentastar V6 engine producing 285 horsepower and 260 lb-ft of torque. A 6-speed manual gearbox will be standard across the board, with the option of swapping to an 8-speed automatic transmission. This motive combination creates enough power to tow up to 7,650 pounds or carry 1,600 pounds of cargo. Jeep will also offer the Gladiator with a 3.0-liter EcoDiesel V6 engine. Not expected to arrive until 2020, the diesel will produce 260 horsepower and a plentiful 442 lb-ft of torque. It’s been about 10 years since Kia introduced the uniquely-styled Soul. When it premiered, there were a number of “boxy” designs on the road, but Soul is the one that has not only survived but flourished. 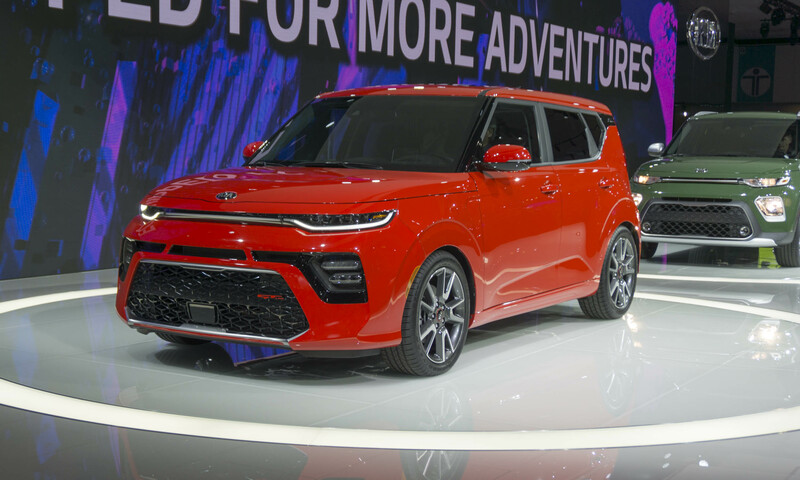 Now the Soul is entering its third generation with the introduction of the completely new 2020 model, featuring all-new styling and an array of new features. While the Soul retains its iconic shape, it gets a modern look with slim headlights, LED daytime running lights and boomerang-shaped taillights that frame the rear window. Inside, the Soul features integrated tweeter speakers and optional mood lighting with multiple color choices that synchronizes to the beat of the music emanating from the audio system. The new Soul will be available with a choice of two gasoline engines as well as a pure electric powertrain. A 147-horsepower 2.0-liter engine is standard, but for those looking for a bit more fun a 1.6-liter turbocharged engine generates 201 horsepower and 195 lb-ft of torque, teamed with a 7-speed dual-clutch gearbox. And for those seeking a more environmentally-friendly option, there’s the fully-electric Soul EV. With similar underpinnings as the Kia Niro EV, the Soul EV gets 201 horsepower and 291 lb-ft of torque. The Soul EV stands out with a unique front bumper and fog lights, exclusive EV 17-inch alloy wheels and a front-mounted charging port. When Kia introduced the Niro hybrid a few years back, the company promised a plug-in hybrid and pure EV would be coming soon. The plug-in hybrid went on sale last year, and at this year’s L.A. Auto Show the all-electric Niro finally debuted. Offering the functionality of a typical compact crossover, the Niro EV utilizes a liquid-cooled 64kWh lithium-ion polymer battery stored under the floor so cabin space is unaffected. With a unique front fascia and dummy grille (no engine cooling is needed), the Niro EV stands out from the rest of the lineup. Niro also sports unique 17-inch alloy wheels designed to reduce wind drag. The Niro EV gets motivation from an electric motor that produces 201 horsepower and a strong 291 lb-ft of torque that comes on instantly for great acceleration. Range hasn’t been announced, but based on the battery power it should be in excess of 200 miles. With a DC fast charger, the Niro EV can gain about 100 miles of range for every 30 minutes of charging. With a Level 2 charger, a full charge will take around 9.5 hours — or overnight for most owners. 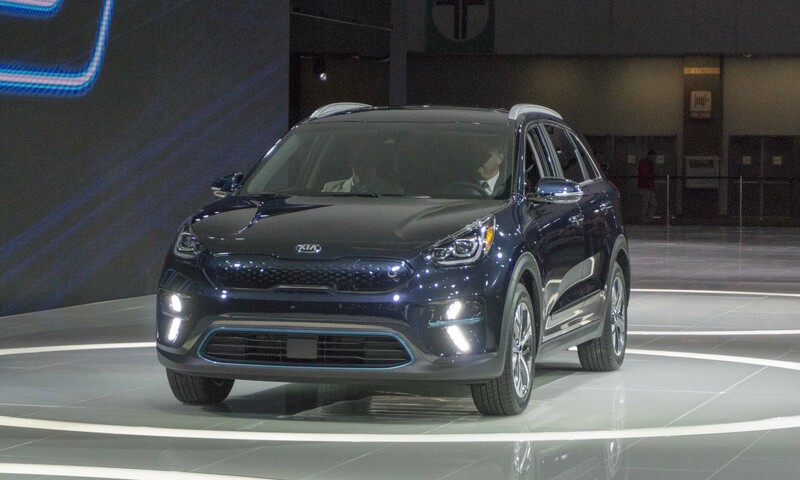 Since electric cars run silently, Kia has given the Niro EV an artificial sound described as a “techy whirring noise.” While this does make the Niro EV sound pretty cool, the noise is actually designed as a safety feature to alert pedestrians to the car’s presence. At last year’s Geneva Motor Show, Lamborghini took the wraps off its hottest version yet of the new Huracan — the Huracan Performante. This year the house of the bull returns with the same car, but sans roof. 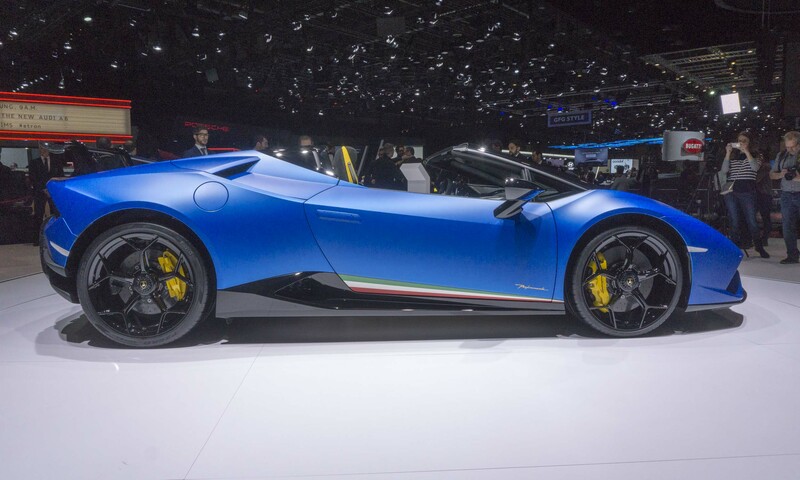 As the name suggests, the Performante takes the already high-performance Huracan Spyder and brings it to a whole new level, accomplished through a combination of weight reduction, active aerodynamics, an enhanced suspension system and — of course — more power. The Huracan Performante Spyder is motivated by a naturally-aspirated 5.2-liter V10 engine producing 640 horsepower — a bump of 38 horses over the standard Huracan, which translates into considerably more wind in your hair. The Performante sprints to 62 mph in 3.1 seconds, 124 mph in 9.3 seconds and eventually reaches a top speed of over 200 mph. Like the Performante Coupe, the open-top Spyder uses Lamborghini’s permanent 4WD system as well as a recalibrated stability control system and dynamic steering, all designed to further improve performance. The lightweight soft-top can be opened in 17 seconds at speeds up to 30 mph. Yes, even Lamborghini has deviated from sports cars to join the SUV scrum by creating the all-new Urus — although to be fair, the Italian automaker also produced the angular LM002 in the 1980s, powered by the same V12 engine as the mid-engine Countach. The LM002 may be the spiritual predecessor to the Urus, but the vehicles couldn’t be more different. Where the LM002 could be best described as a brute, the Urus is streamlined with sleek lines that give props to the Huracan and Aventador. The front end is unique to Urus; however, the taillights and quad exhaust also fit with the look of the brand’s two supercars. 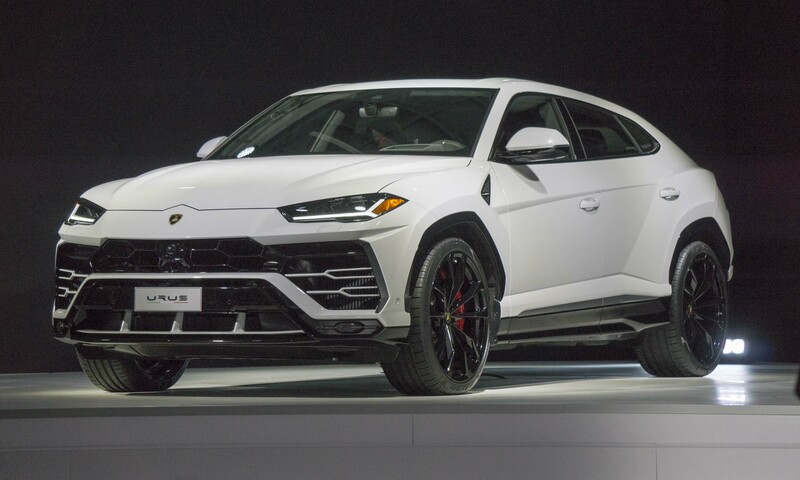 Expected to perform on par with sports cars, the Urus draws power from a twin-turbocharged 4.0-liter V8 engine producing 650 horsepower and 627 lb-ft of torque as low as 2250 rpm. The leap to 100 km/h (62 mph) happens in a supercar-like 3.6 seconds. Power gets delivered to tarmac or dirt via a custom 4-wheel-drive system with active torque vectoring as well as 4-wheel steering. 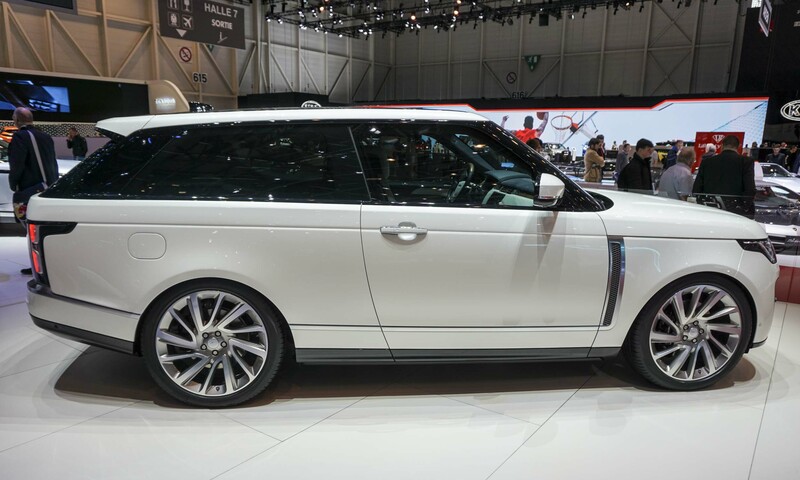 Land Rover debuted the very luxurious limited-edition 2-door Range Rover SV Coupe at this year’s Geneva show. No more than 999 copies will be built, and customers will be offered extensive personalization options, with extremely high standards for materials and craftsmanship. The Range Rover SV Coupe presents a powerful stance on the road but also exhibits elegant touches such as power-close doors with frameless glass. Liquesence, an all-new optional paint finish for Land Rover, offers a liquid metal finish for the first time. The Range Rover SV Coupe is also the first Range Rover offered with a 23-inch wheel option. The enhanced luxury and exquisite craftsmanship continues inside with semi-aniline leather front seats featuring a gradated diamond quilt design unique to the SV Coupe. The Range Rover SV Coupe is powered by a supercharged 5.0-liter V8 engine producing 557 horsepower and 516 lb-ft of torque, making it the fastest full-size Range Rover ever produced. According to Land Rover, the Range Rover SV Coupe will accelerate from zero to 60 mph in 5 seconds flat with a top speed of 165 mph. This will also be the most expensive production Land Rover with a base price of $295,000. 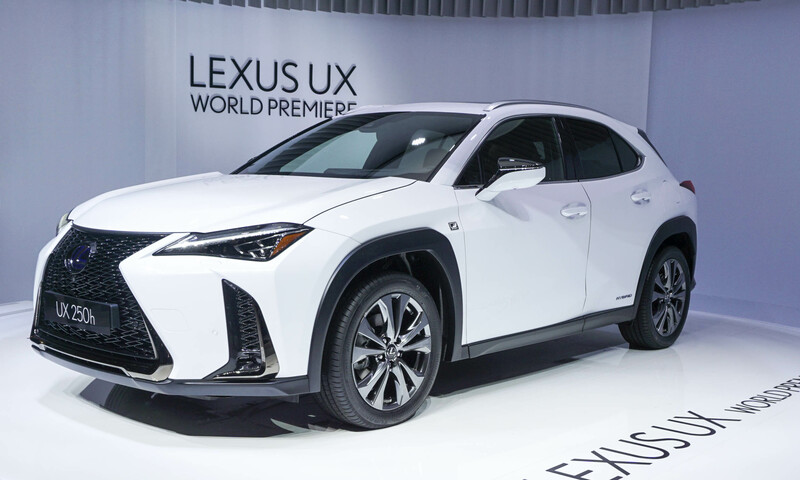 The Lexus UX — the first ever compact luxury crossover from Lexus — made its U.S. debut in New York. The first Lexus vehicle to use the brand’s Global Architecture — Compact platform, the UX benefits from a rigid structure and low center of gravity to deliver both agile handling and ride comfort. The exterior design is similar to the larger NX and RX models but more aggressive, with a large spindle grille that dominates the front view along with flared fenders. The UX is offered in two versions for the U.S. market: UX 200 and UX 250h. The UX 200 gets power from a new 169-horsepower 2.0-liter engine while the UX 250h is powered by the same 2.0-liter engine teamed with a new fourth-generation hybrid drive system with total system output of 181 horsepower. E-Four All-Wheel Drive adds an additional electric motor at the rear axle to give the 250h AWD capability. Both UX 200 and UX 250h will be offered as F SPORT versions with sport-tuned suspension and available adaptive variable suspension. 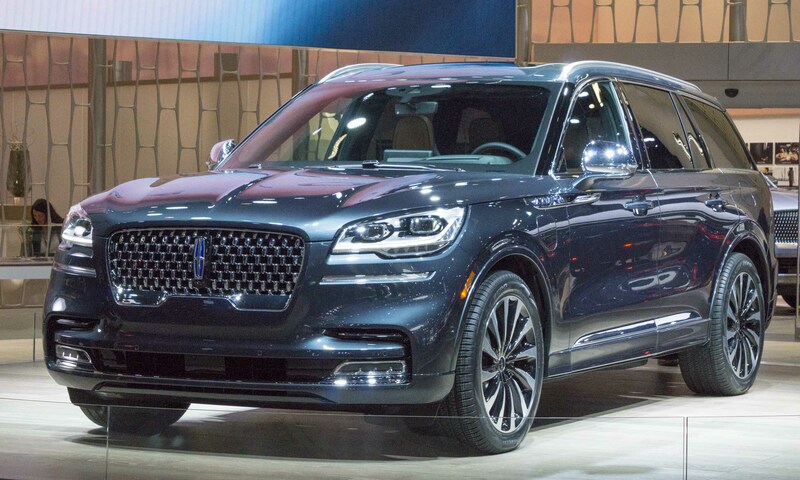 Lincoln is continuing to expand its lineup with the introduction of the all-new Aviator midsize premium SUV. Up front is the familiar mesh Lincoln grille followed by flowing lines that are said to be inspired by flight. “The connotations of flight are intrinsic in the lines of the vehicle,” said David Woodhouse, design director at The Lincoln Motor Company. Aviator debuts new technology including using a smartphone as the vehicle key, lowering the vehicle to greet the driver and scanning the road to adjust the suspension for uneven pavement. Aviator will also introduce advanced hybrid technology via the Aviator Grand Touring, powered by a hybrid drivetrain that combines a twin-turbocharged 3.0-liter V6 engine with electrified technology expected to produce a combined 450 horsepower and 600 lb-ft of torque. The standard twin-turbocharged 3.0-liter V6 engine is projected to produce 400 horsepower and 400 lb-ft of torque. Aviator offers available all-wheel drive, and Lincoln Drive Modes allow the driver to adjust vehicle performance with five settings: Normal, Conserve, Excite, Slippery and Deep. A year ago Mazda showed the beautiful Kai Concept at the Tokyo Motor Show and the reaction was very positive. 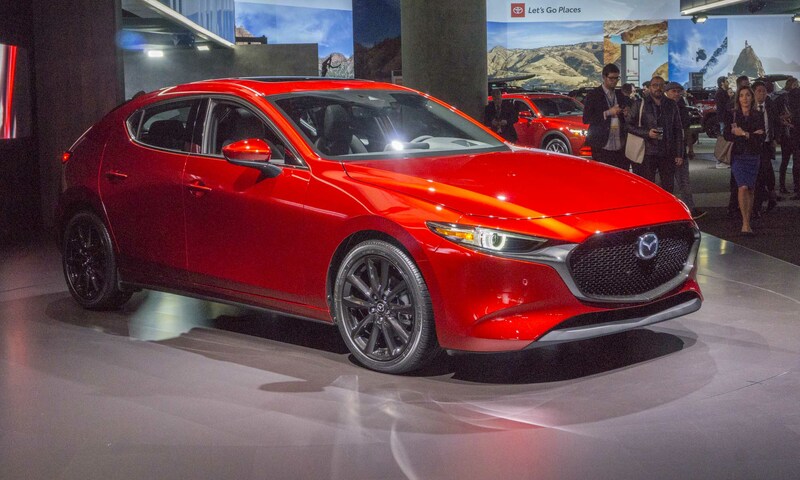 Recently in L.A. the company showed the production version of the all-new Mazda3 and it remains surprisingly similar to that original concept. Available as a hatchback or sedan, the Mazda3 adopts the latest evolution of the company’s KODO design, with the goal of giving the hatchback more emotional styling, while the sedan is designed to have a more elegant stance. Mazda hasn’t announced which powerplants will be available in America; however, expect the lineup to be similar to the current offerings, which include a 2.5-liter SKYACTIV G motor. The Mazda3 will also be available with Mazda’s i-Activ all-wheel-drive system as well as a suite of available high-tech safety features. These include i-Activsense which uses both an infrared camera and infrared LED to observe the driver’s condition while driving, checking to see how wide open the driver’s eyelids are and the number of times he or she blinks in order to determine the level of drowsiness or fatigue. It also monitors the driver’s line of sight and eye movement to determine when the driver is being inattentive. 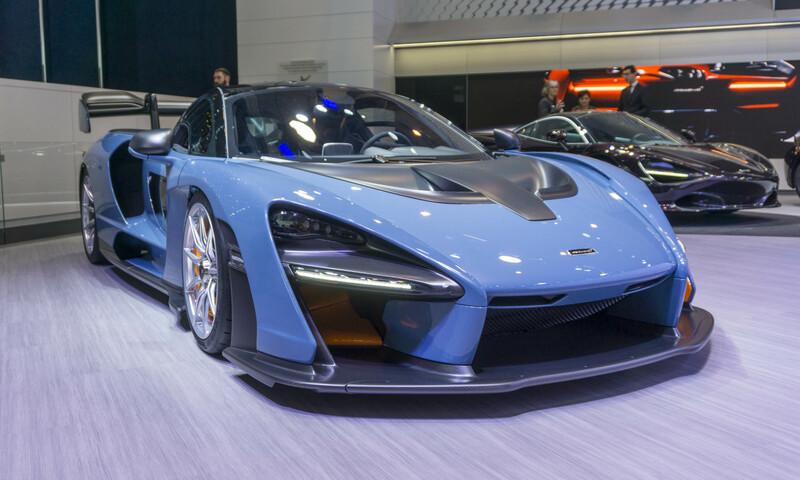 Named for late three-time Formula One World Champion Ayrton Senna, the eponymous car is the newest exotic from McLaren, designed to be the ultimate performance car for both street and track. The Senna uses the company’s most powerful internal combustion engine it has ever put into a road car, which is a 4.0-liter twin-turbo V8 engine that produces a mind-boggling 789 horsepower and 590 lb-ft of torque. Weighing in at a mere 2,641 pounds, the Senna is the lightest road car from McLaren since the legendary F1. The light weight and enormous power make for some impressive stats. The new McLaren Senna can reach 62 mph in 2.8 seconds, 124 mph in 6.8 seconds and can complete a quarter mile in 9.9 seconds. Top speed is listed at 211 mph. 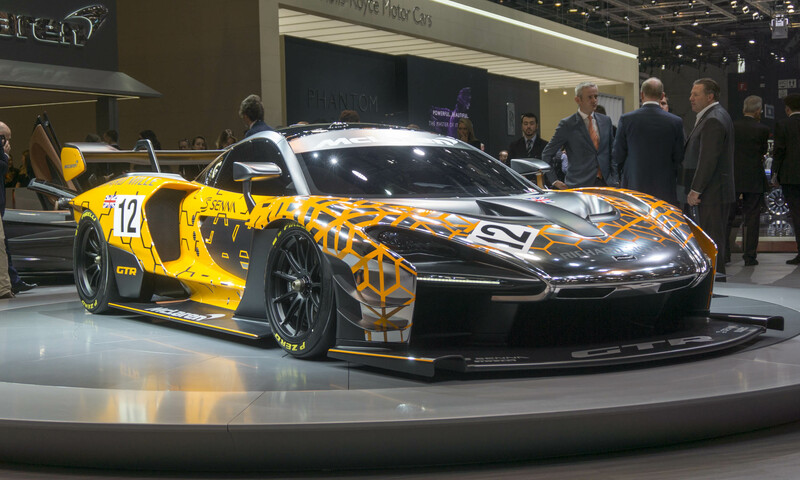 In addition to debuting the all-new Senna, McLaren took the wraps off another hypercar in Geneva — the Senna GTR. Designed exclusively for track use, the Senna GTR takes the extreme Senna to another level. The twin-turbo V8’s output gets an increase to at least 813 horsepower, and the car is fitted with a race-style transmission. A revised suspension and Pirelli slick tires at all four corners mean better handling on track. The Senna GTR will also generate upwards of 2,200 pounds of downforce. 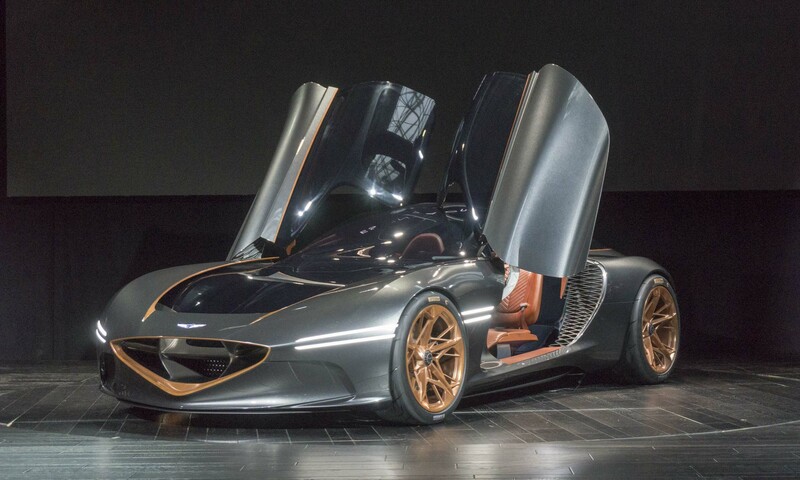 Only 75 of these track-only Sennas will be built, each priced around $1.4 million. As the high-performance tuning group associated with Mercedes Benz, AMG has produced two standalone sports cars: the SLS AMG and the current AMG GT. However, the brand had never produced a 4-door sports car — until now. 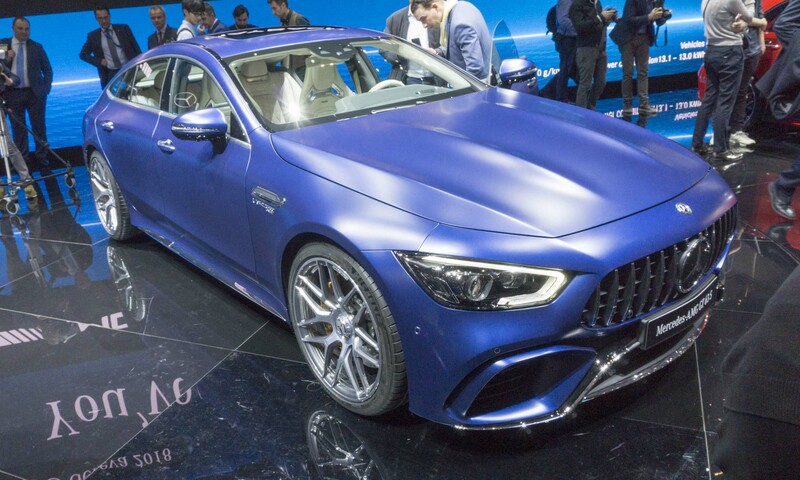 The all-new AMG GT 4-Door Coupe made its debut at the 2018 Geneva Motor Show, offering impressive performance and gobs of power in a sleek 4-door configuration. Joining the ranks of vehicles such as the Porsche Panamera and Audi A7, the newest AMG GT is a fastback design. This not only provides a sleek silhouette but also adds versatility thanks to considerable cargo space. There will be three different variants of the AMG GT 4-Door Coupe, ranging from the 429-horsepower GT 53 to the top-level AMG GT 63S, which boasts a hand-built biturbo 4.0-liter V8 engine that generates 630 horsepower and 627 lb-ft of torque. The GT 63 S jumps to 60 mph in about 3 seconds and achieves a top speed of 195 mph. All variants of the AMG GT 4-Door Coupe come with AMG’s Speedshift 9-speed automatic transmission and AMG 4MATIC high-performance all-wheel-drive system. The top-selling Mercedes-Benz model, the C-Class receives updated styling, more power and additional Intelligent Drive features shared with the E-Class. Most noticeable changes to the C-Class include new front and rear bumper designs; new design LED headlight and taillights now standard; a diamond radiator grille with AMG-Line; and lower rear bumper and exhaust trim that varies depending on equipment level. An LED Intelligent Light System with High Performance headlights and ULTRA WIDE high beam is optionally available. The new C-Class is available with the Intelligent Drive driver-assistance systems offered in the E-Class, such as Active Distance Assist DISTRONIC; active lane-change assist and active emergency stop assist as functions of active steering assist; and standard active brake assist. A new turbocharged 2.0-liter produces 255 horsepower and 273 lb-ft of torque — an increase of 14 horsepower over the previous model — and is combined with a 9G-TRONIC 9-speed automatic transmission. 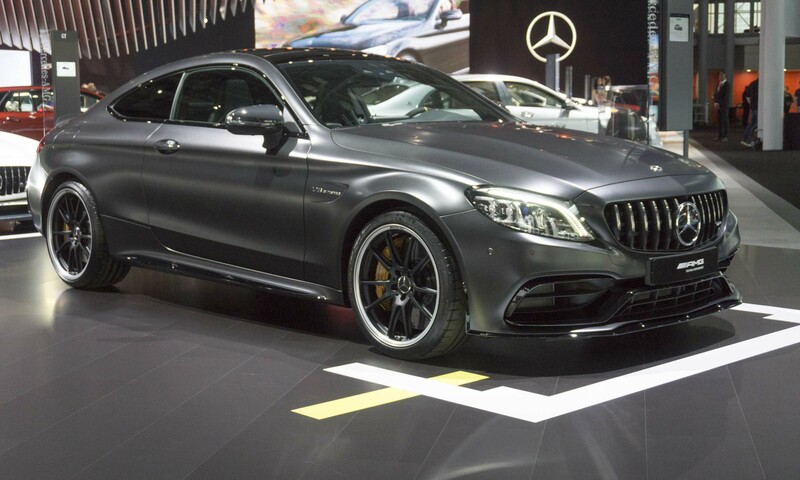 Following the introduction of the new C-Class in Geneva, New York played host to the next step in the C-Class lineup — the all-new AMG C63, showcased in sedan, coupe and cabriolet form. 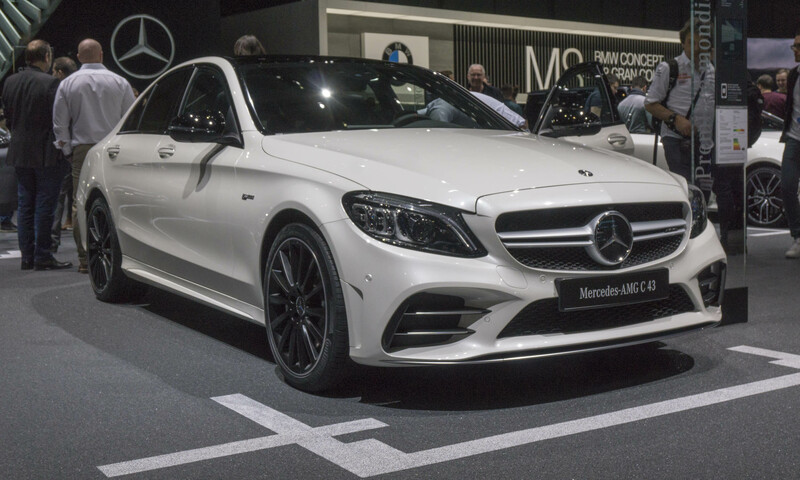 Standing out with an AMG-specific grille, the C63 carries a more muscular appearance than the standard C-Class, thanks to side skirts, additional air inlets, quad exhaust outlets, a rear lip spoiler and aerodynamically optimized AMG light-alloy wheels. Inside are performance seats with integrated head restraints and available heating and cooling. The cabriolet adds the innovative Airscarf neck-level heating. Under the hood of the C63 lurks a handcrafted AMG 4.0-liter biturbo V8 engine that generates 479 horsepower, or 503 horsepower in the C63 S. The powerful engine is matched to a 9-speed AMG Speedshift transmission. For improved driving dynamics, the C63 uses an electronically-controlled rear-axle limited-slip differential that reduces slip on the inside wheel during cornering, providing improved traction when accelerating out of the corner. The quickest of the three body styles, the C63 coupe can reach 60 mph in less than 4 seconds. 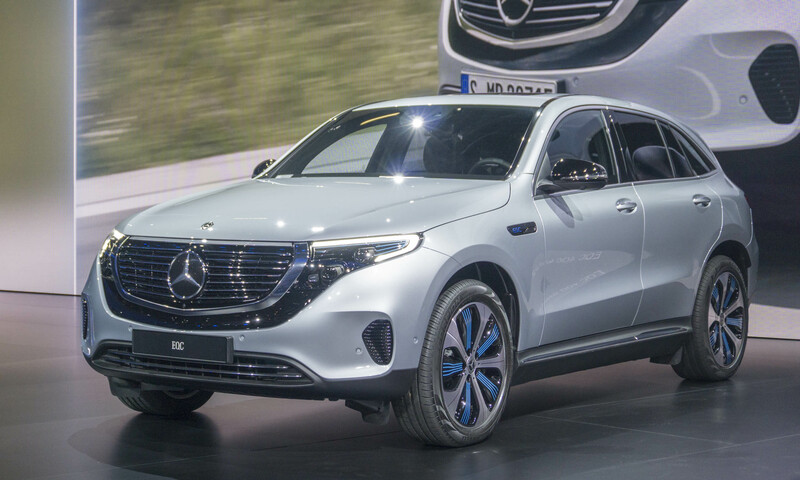 Two years ago at the Paris Motor Show Mercedes-Benz introduced an entirely new brand called EQ, which would be the home for a new line of electrified vehicles. This year the first of these new models made its debut — the all-new Mercedes-Benz EQC. As with other mainstream electric vehicles on their way to market from other European brands — the Jaguar i-PACE and Audi e-tron to be specific — the first electric Mercedes will be a crossover SUV. Exterior styling is similar in overall shape to the current GLC; however, the new EV has sleeker lines with a flush grille and headlights. This fully-electric midsize crossover is powered by two electric motors — one at each axle. The unique electric all-wheel-drive system uses the two motors in different ways. The front motor is configured for efficiency in the low to medium load range, while the rear motor adds a level of sportiness. The two motors of the Mercedes-Benz EQC combine to produce a total 402 horsepower and 564 lb-ft of torque. The EQC is no different and will sprint to 60 mph in an estimated 4.9 seconds. Mercedes-Benz lists a preliminary range of around 200 miles from the 80 kWh lithium-ion battery pack. 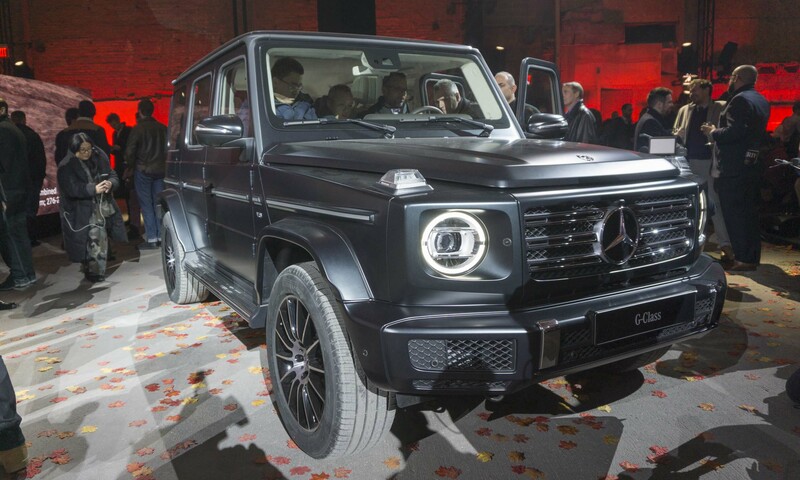 Mercedes-Benz debuted the next generation of the iconic G-Class off-road vehicle in Detroit, staying loyal to the original style, which has remained largely unchanged since the 1979 model. Classic design elements include signature door handles, exposed door hinges and fender-mounted signal lights. But the new G-Class is a proper Mercedes with standard leather seats, 3-zone climate control, a steering wheel with new touch-control buttons, a 12.3-inch COMAND display, a Burmeister surround-sound system and acoustic-laminated glass. First availability will be the G550, powered by a high-performance 4.0-liter biturbo engine producing 416 horsepower and 450 lb-ft of torque from 2500 to 4750 rpm. Off-road capability remains impressive with full-time four-wheel drive, three 100 percent differential locks for the center, front and rear differentials and DYNAMIC SELECT with five driving modes, now including G-mode for off-road use. The suspension is revised to improve both on and off-road performance. Electromechanical power steering is standard with 19-inch wheels, and an Adaptive Damping System is optional. With the world debut of the redesigned G-Class taking place in Detroit in January, it was only a matter of time before the AMG version of this big SUV came out. 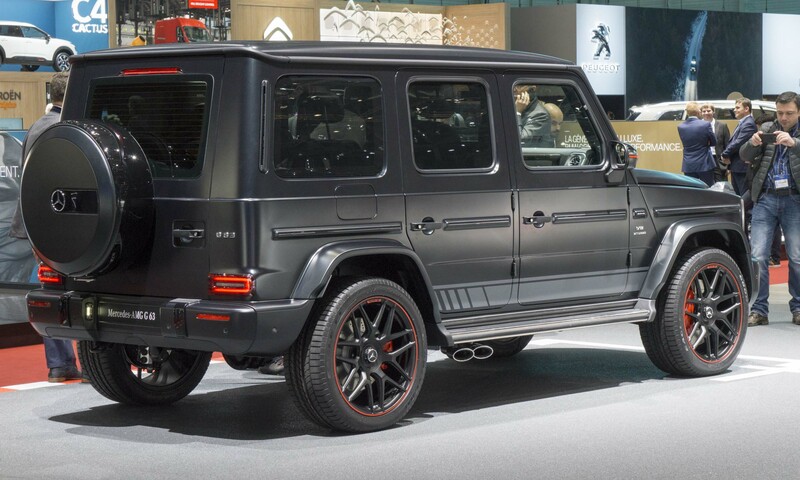 The high-performance Mercedes-AMG G63 debuted in Geneva with a powerful drive system, AMG-developed suspension, AMG-specific transmission modes and a new interior with a widescreen cockpit. At the heart of the G63 is the hand-built AMG 4.0-liter V8 biturbo engine producing 577 horsepower and 627 lb-ft of torque, teamed with the fast-shifting AMG SPEEDSHIFT TCT 9G transmission. 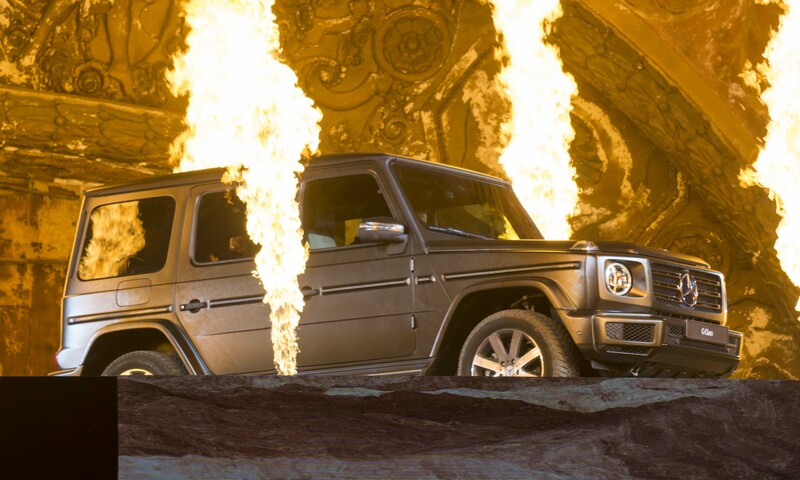 The G63 accelerates from zero to 60 mph in 4.4 seconds. Top speed is limited to 137 mph or 149 mph with the AMG Driver’s Package. AMG Performance 4MATIC all-wheel drive features rear-biased torque distribution with a front / rear split of 40 to 60 percent and includes three differential locks for proper off-road capability. 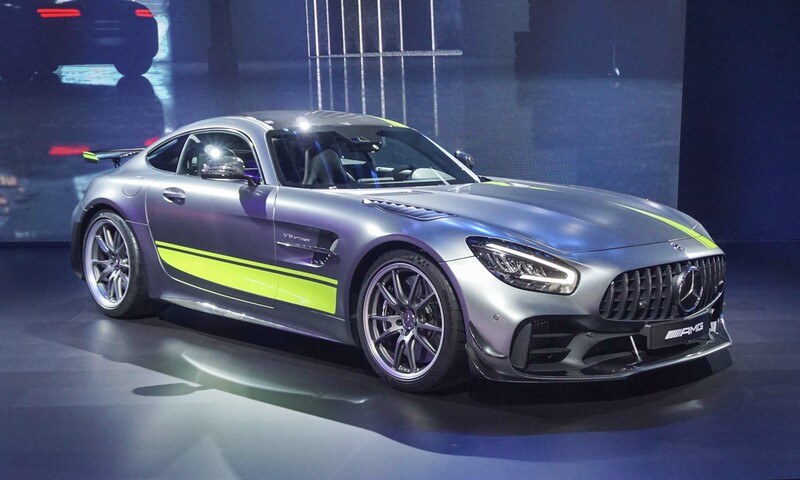 Mercedes-AMG revealed the latest version of its street-legal race car in Los Angeles — the AMG GT R Pro. Taking lessons learned from the AMG GT3 and AMG GT4 race cars, the GT R Pro gets improvements in suspension, aerodynamics, construction and appearance. The AMG GT R Pro is already lightweight through its use of multiple carbon fiber components. Now further weight savings is achieved via ceramic composite high-performance braking system standard. Aerodynamics have been fine tuned for the AMG GT R Pro to improve performance. The front splitter is extended forward with small metal braces to stabilize at higher speeds. At the rear, the spoiler is fitted with a lip that increases downforce at the rear axle. Powering the AMG GT R Pro is a more powerful version of the 4.0-liter twin-turbo V8 that produces 577 horsepower. With AMG GT3 racing driver Maro Engel behind the wheel, the GT R Pro completed a lap of Germany’s famed Nurburgring racetrack in 7.04.632 — considerably quicker than the previous version of the AMG GT R.
One of the most important introductions at the Mercedes-Benz stand in Paris was the all-new GLE midsize SUV. Completely new for the 2019 model year, the GLE boasts advancements in safety, entertainment, connectivity and drivability. 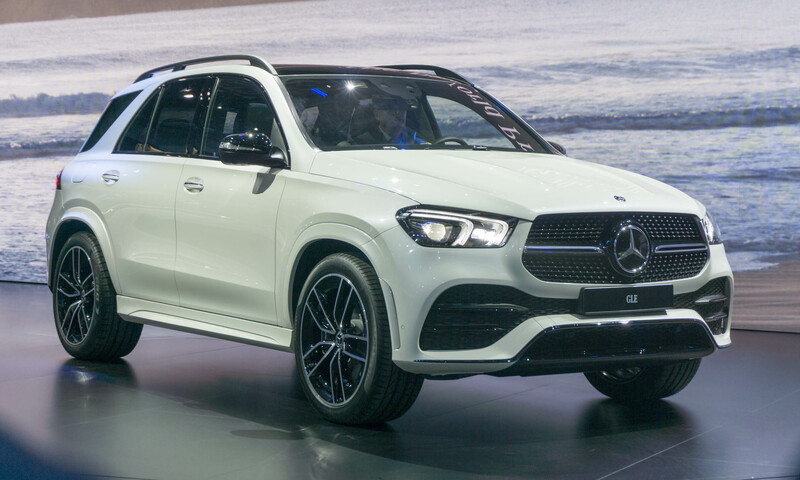 Styling is all new with a grille that is more in line with the recently-updated GLC but enhanced by a dual power-dome hood and large air intakes. The LED Intelligent Light System features an ultra-wide beam; they are the brightest allowed on a motor vehicle. Large wheels with prominent wheel arches emphasize the new SUV’s power and capability. Although most GLE buyers will be more interested in the added seating comfort and advanced safety features, Mercedes has given the GLE impressive capabilities on and off the road. On pavement the E-Active Body Control works with the active suspension to control spring and damping forces at each wheel, making it possible to counter body roll as well as pitch and squat. The GLE is also designed to excel in off-road situations, smoothing the ride as well as delivering up to 100 percent of the torque to either axle as needed. 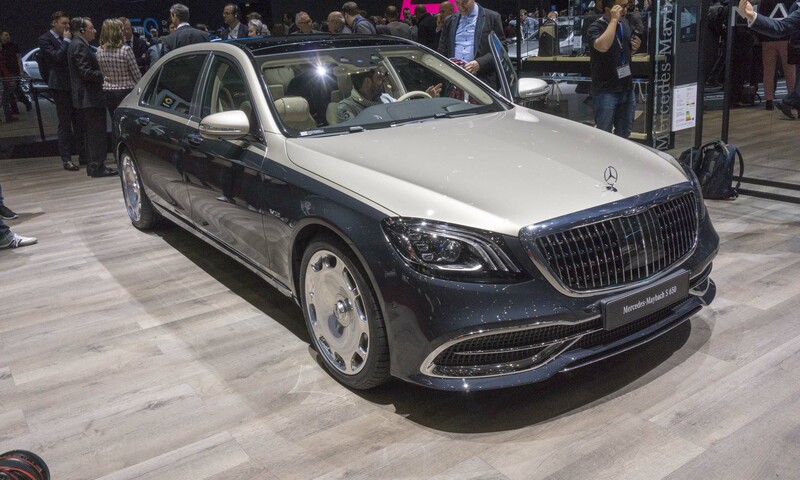 The most exclusive model in the Mercedes-Benz lineup, the Mercedes-Maybach S-Class receives further refinements for the 2019 model year with a new grille, optional two-tone paint and new interior color combinations. The new grille features fine, vertical struts first seen on the Vison Mercedes-Maybach 6 concept that debuted at Pebble Beach in August 2016. A classic Mercedes-Maybach look, the two-tone paint is now offered in nine color combinations. A new option for dark colors is double clear coat with sanding between the two layers; the second coat gets applied by hand. A choice of three new 20-inch multispoke wheel combinations completes the exterior updates. The black Maybach Exclusive Nappa leather upholstery appointments can also be ordered with a choice of copper, gold or platinum contrast stitching. A new trim option is also available in designo Magnolia flowing lines. The Mercedes-Maybach S-Class is offered in S560 4MATIC and S650 versions, the latter of which features a 6.0-liter biturbo V12 producing 621 horsepower and 738 lb-ft of torque. Altima is the best-selling passenger car in the Nissan lineup, and the brand is hoping to maintain that position with an all-new version of the popular sedan. 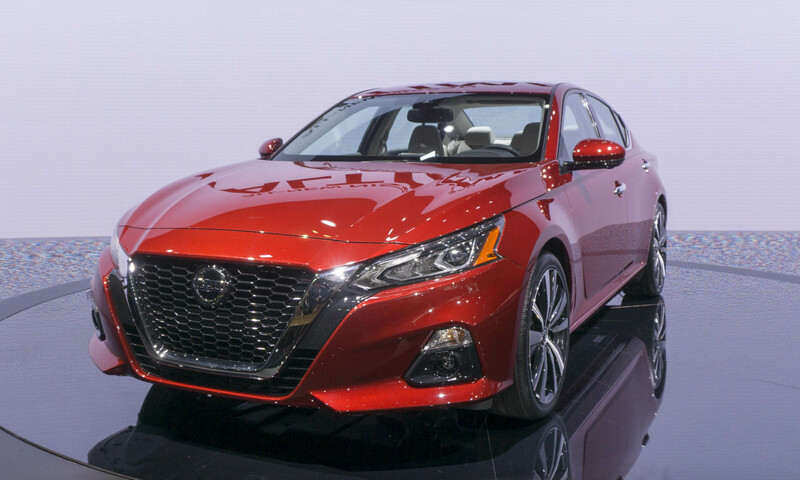 The sixth-generation Altima premiered in New York with a more dynamic design taking inspiration from the Vmotion 2.0 concept that debuted at the 2017 Detroit Auto Show. The 2019 Altima features key Nissan design elements including the V-Motion grille, floating roof and boomerang lights. The standard engine for the 2019 Nissan Altima is a new 2.5-liter 4-cylinder unit producing 188 horsepower and 180 lb-ft of torque — an increase of 9 horsepower over the previous model with an increase in fuel efficiency. The new optional engine is a 2.0-liter VC-Turbo, the first production variable compression ratio engine that debuted in the Infiniti QX50 crossover. The VC-Turbo engine continuously adjusts its compression ratio to optimize both power and efficiency, producing 248 horsepower and 273 lb-ft of torque. For the first time Nissan will offer the Altima with all-wheel drive. Polestar has been building special high-performance versions of Volvo models since 2013, and this year Volvo took the brand to the next level. Not only was the Polestar 1 an all-new model debuting at the 2018 Geneva Motor Show, it also represents the launch of Polestar as a standalone electric performance brand. Polestar 1 is a 2-door GT car with seating for four, built on Volvo’s new Scalable Platform Architecture. Although the car possesses clear styling cues associated with the Volvo brand — most notably the “Thor’s Hammer” headlights — the Polestar 1 is unique to the new brand. As a showcase of what to expect from Polestar, the Polestar 1 features a plug-in hybrid powertrain that produces 600 horsepower and 738 lb-ft of torque. The hybrid system consists of a 2.0-liter turbocharged and supercharged 4-cylinder engine that sends power to the front wheels while two electric motors drive the rear wheels. With a total of 34 kWh produced by three battery stacks, the Polestar 1 can travel up to 93 miles on electric power alone. 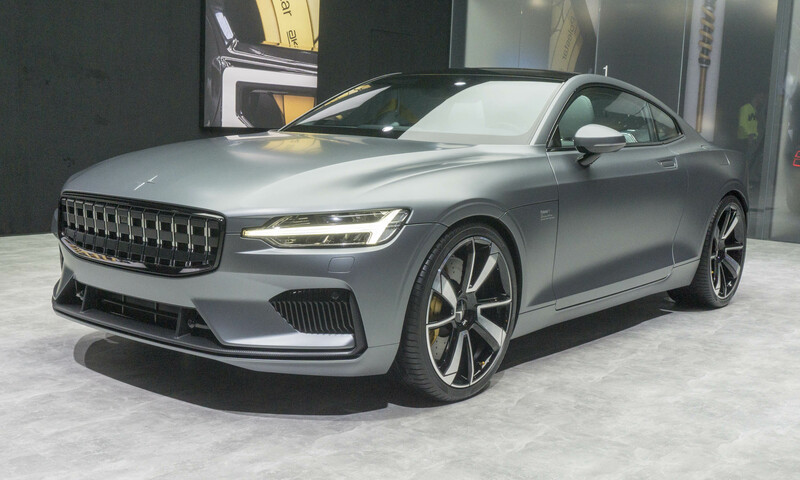 The Polestar 1 is expected to be available to consumers in the middle of 2019. California is one of the most important markets for Porsche, so it is fitting that the German car company chose the L.A. Auto Show to debut the 8th generation of the legendary 911. 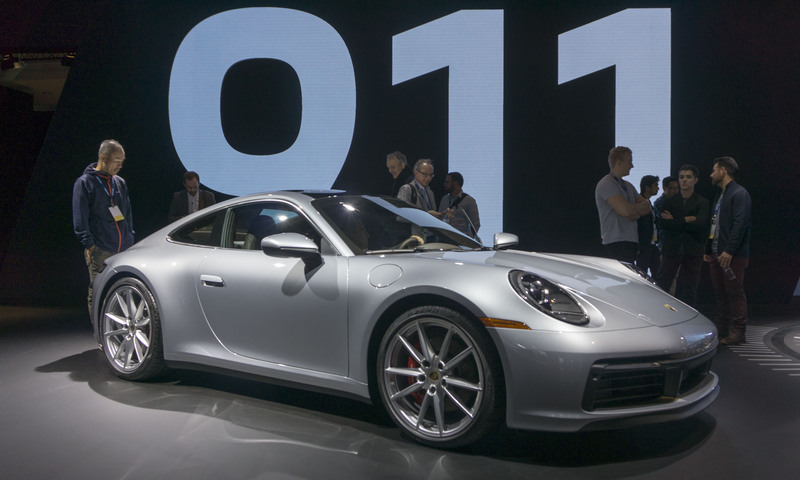 “California is the ideal place to introduce the new 911. California has been like a second home to Porsche for decades,” said Oliver Blume, CEO of Porsche AG. Of course, like all the generations before it, this new version still looks like a 911, but there have been a number of updates. The new 911 is wider thanks to larger fenders, and features newly-developed LED headlights. Exterior mirrors have been redesigned to reduce wind noise. The initial trims of the 2020 Porsche 911 will be the Carrera S and Carrera 4S. Both are powered by the next-generation turbocharged flat-six motor that produces 443 horsepower and 290 lb-ft of torque. The new 911 gets a number of feature updates — one of the most interesting is Wet Mode. This function detects water on the road, then adjusts the stability control and anti-lock brake systems accordingly and warns the driver. The 2020 911 Carrera S will have a base price of $113,200, and the 4S will start at $120,600. Dealers are accepting orders now, with deliveries expected to begin summer 2019. 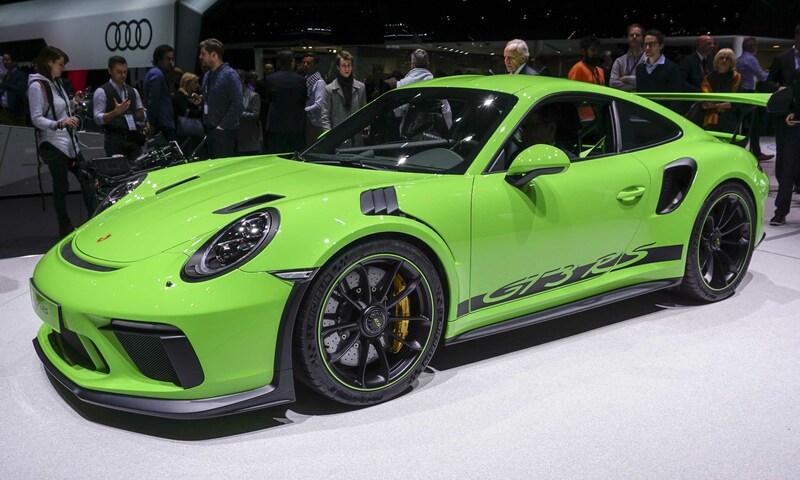 Porsche chose this year’s Geneva Motor Show to introduce the latest iteration of its legendary 911 — the GT3 RS. The latest race-bred, high-performance 911, the 911 GT3 RS joins the 911 GT3 and the 911 GT2 RS which were both new for the 2018 model year. Based on the 911 GT3, the design of the wide body 2019 911 GT3 RS was determined by aerodynamics and lightweight construction. Like the 911 GT3, the front and rear fascias are made of lightweight polyurethane, while the hood and front fenders are carbon fiber and the roof is magnesium. The hood has air ducts like the 2018 911 GT2 RS for improved brake cooling without increasing drag. The GT3 RS is powered by a naturally-aspirated 4.0-liter horizontally-opposed 6-cylinder engine producing 520 horsepower and 346 lb-ft of torque, making it the most powerful naturally-aspirated engine ever offered for a street-legal 911. That’s enough power to push the new 911 GT3 RS to 60 mph in 3 seconds flat, with a top track speed of 193 mph. Inside, the 911 GT3 RS is fitted with racing-style seats with a high level of lateral support and carbon-fiber reinforced backrests. To save weight, rear seats are omitted, sound insulation is reduced, and lightweight door panels are fitted with door opening loops replacing the door handles. A few years ago in Germany at the Frankfurt Motor Show, Porsche provided a first peek into the company’s plans for electrification with the debut of the Mission E electric sports car. Planned to be the first all-electric 4-seat sports car from the German automaker, the Mission E would have legendary Porsche performance with new levels of efficiency and innovation. 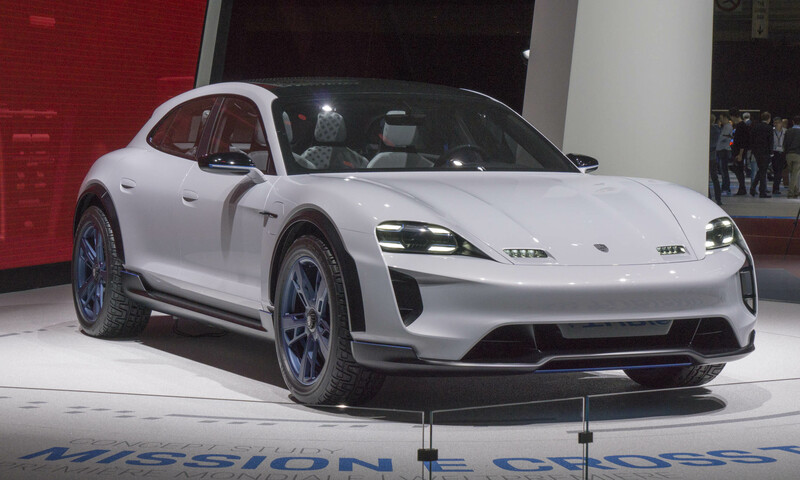 While work continues on this new sport sedan, Porsche took the wraps off the next step in its move toward electrification with the debut of the Mission E Cross Turismo. This new concept was designed to offer crossover versatility with Porsche performance and high efficiency. Porsche says the Mission E Cross Turismo would deliver 600 horsepower and offer a range of around 310 miles. It would also be expected that a recharge of 15 minutes would produce as much as 250 miles of additional range. Acceleration would also be strong, jumping to 62 mph in around 3.5 seconds. All-wheel drive, Porsche torque vectoring, adaptive air suspension and Dynamic Chassis Control all ensure Porsche levels of performance and agility. The Ram 1500 is all-new for 2019 from its exterior styling and redone interior down to the chassis and powertrain choices. The 2019 Ram offers more capability, better fuel economy and an impressively innovative interior. The new design is more aggressive with a forward-leaning grille (offered in six different styles) and a raised aluminum hood with engine badges on the sides. The new Ram will be available in either Quad Cab or Crew Cab configuration with interior options from vinyl to premium leather. 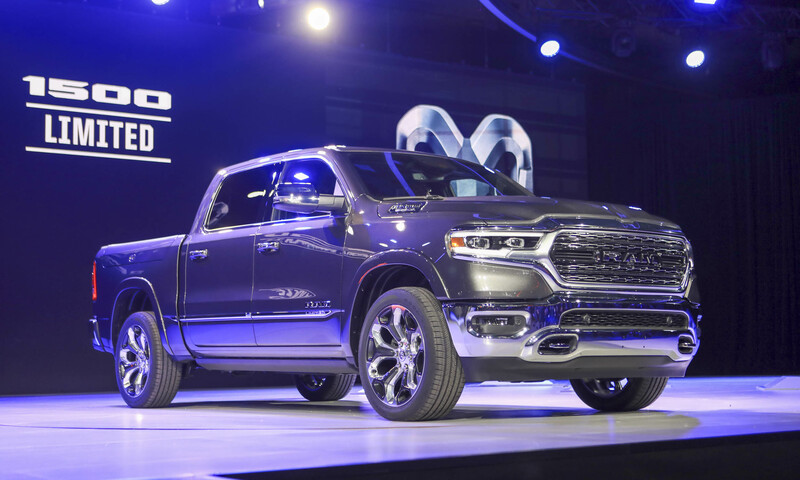 The Ram will initially be available with either a 305-horsepower 3.2-liter Pentastar V6 or a 395-horsepower 5.87-liter HEMI V8 powertrain, and both will be equipped with the eTorque mild hybrid system, which adds up to 90 lb-ft of torque for the V6 and 130 lb-ft for the HEMI. This system combines a belt-driven motor generator unit with a 48-volt battery for seamless start / stop function, a short-duration torque boost to the driveline and brake energy regeneration. Granted there are numerous hybrid sports cars on the market, but the new Rimac C2 goes one step further by showing what’s possible with a pure electric powertrain. The second model from the Croatia-based car company, the C2 is stunning both in appearance and capability. The C2 features an electric motor at each wheel, all of which are controlled via the Rimac All-Wheel Torque Vectoring system. Each motor can be used to operate ABS, stability control and an adaptable all-wheel-drive system. 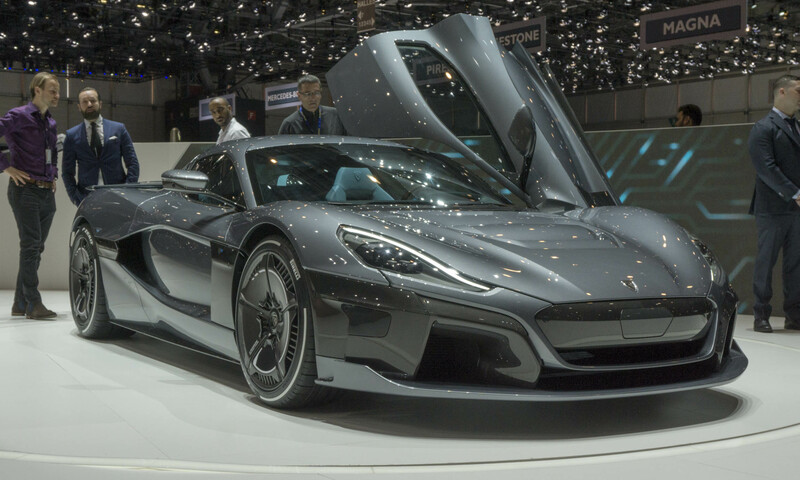 Powering the Rimac C2 is a 120-kWh battery back that can provide a range of around 400 miles, or as the press materials point out, two laps of the famed Nurburgring at full power. Full power is a lot in the C2 — the four motors combine to produce a mind-boggling 1914 horsepower and almost 1,700 lb-ft of torque. With power at all four wheels, acceleration to 60 mph is accomplished in a mind-blowing 1.85 seconds, reaching 100 mph in a mere 4.3 seconds. While the stats are beyond exotic, the C2 carries its passenger like a true GT car with high-quality materials in the spacious cabin in addition to a usable trunk. 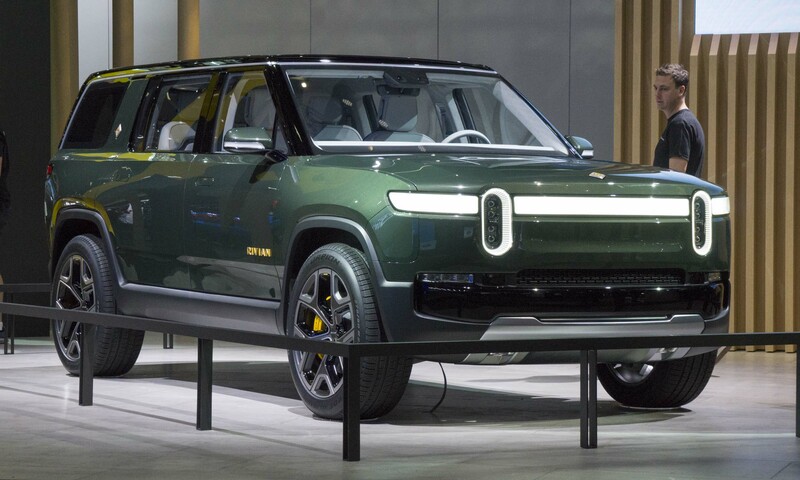 Rivian is an electric vehicle manufacturer founded by RJ Scaringe, and the company debuted the Rivian R1T at the 2018 Los Angeles Auto Show. A 5-passenger electric pickup truck described by the company as the world’s first electric adventure vehicle, R1T is propelled by a powerful quad-motor system that delivers precise torque to each wheel. 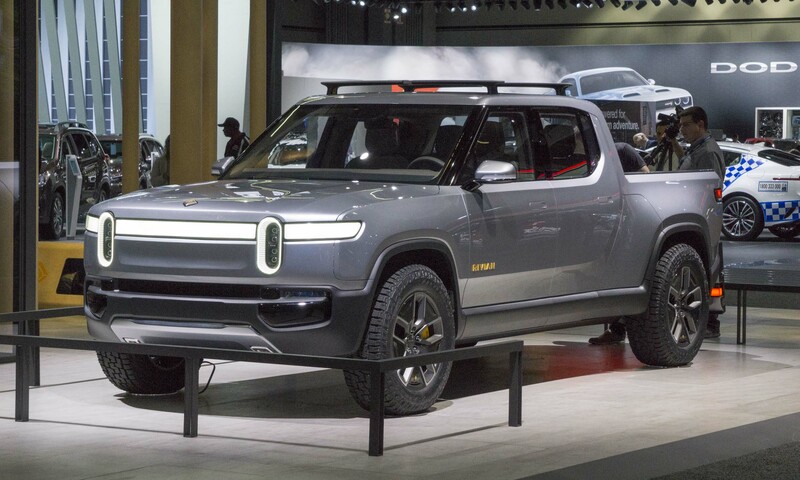 According to Rivian stats, the R1T will accelerate from zero to 60 mph in 3 seconds and from zero to 100 mph in less than 7 seconds, with towing capacity rated at 11,000 pounds. The Rivian R1T is built on a skateboard platform that packages all the batteries, drive units, suspension, braking and thermal systems below the height of the wheels for a low center of gravity and creative use of space for passengers and cargo. The Rivian R1T features signature vertical headlights and a full-width daytime running light. One unique feature is a lockable gear tunnel behind the cab and below the pickup bed that extends from one side of the truck to the other; the R1T also has lockable storage under the hood. Deliveries of the Rivian R1T are expected to begin in late 2020. Alongside the R1T in L.A. sat a second Rivian model — a 7-passenger SUV built on the same skateboard platform as the R1T pickup. The R1S shares the front-end design and overall appearance with the R1T including the vertical headlights and the horizontal daytime running lights, but at the rear the R1S design creates room for passengers and cargo. The R1S has a liftgate and a small tailgate providing a place to sit, and the second and third row seats fold flat. Powered by the same quad-motor system as the R1T, Rivian claims the same performance numbers: the R1S will accelerate from zero to 60 mph in 3 seconds and from zero to 100 mph in less than 7 seconds with a top speed of 125 mph. Rivian will offer a choice of three battery packs and estimates a range of 230 miles with the 105kWh battery pack, 300+ miles with the 135 kWh battery pack and 400+ miles with the 190 kWh battery pack. The batteries are designed for fast charging and approximately 200 miles of driving range can be added in 30 minutes. Deliveries of the R1S are scheduled to begin in early 2021. Subaru unveiled a new plug-in hybrid version of its popular small crossover at the Los Angeles Auto Show — the first-ever plug-in hybrid from Subaru. 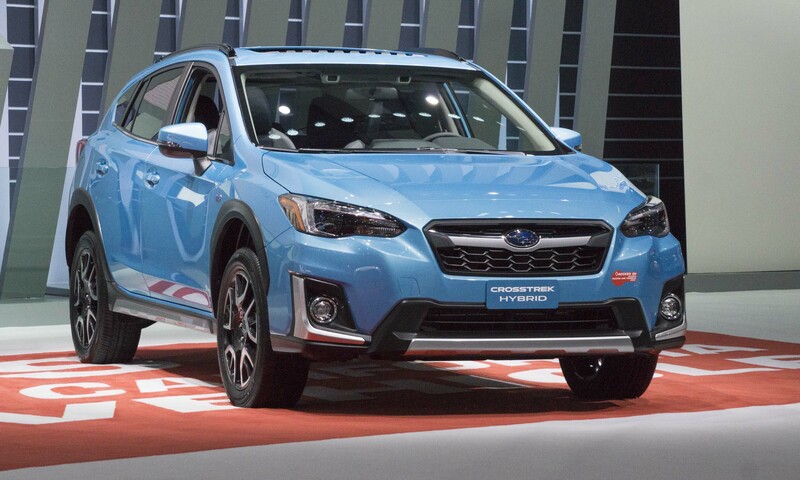 The most fuel-efficient version of the Crosstrek ever, the 2019 Crosstrek Hybrid features Subaru StarDrive Technology that employs two electric motors with the 2.0-liter Subaru Boxer engine and a new Lineartronic continuously variable transmission. One of the electric motors works as the engine starter motor and can be powered by the engine to function as a generator for the hybrid battery. The second electric motor is used for electric driving modes and charges the battery during regenerative braking. The Subaru Crosstrek Hybrid can travel in electric mode at up to 65 mph with a range of 17 miles on electric power alone with a total range of 480 miles using gasoline and electric power. The Crosstrek Hybrid is a full second faster in the sprint to 60 mph than the standard Crosstrek and can achieve up to 90 MPGe. A new exterior color, Lagoon Blue Pearl, is exclusive to this hybrid, which is distinguished from the standard model by blue headlight projector rings; a silver metallic finish on the grille, a lower front bumper and body cladding; and fog light accents. 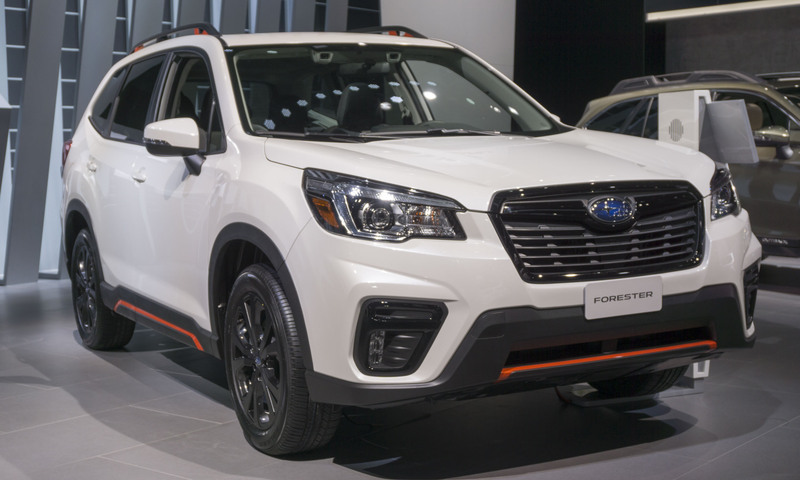 The all-new 2019 Subaru Forester debuted at the New York Auto Show — the fifth generation of the popular SUV and the roomiest Forester ever offered. Built on the Subaru Global Platform, the new Forester’s wheelbase increases by 1.2 inches which means more rear seat legroom and additional cargo capacity. Subaru’s EyeSight Driver Assist Technology is standard, and Forester Touring will debut DriverFocus safety technology that can alert the driver of fatigue or distraction, and also will automatically adjust many driver settings at start-up. The new Forest is powered by an updated direct-injection 2.5-liter Boxer engine that produces 182 horsepower and 176 lb-ft of torque, combined with a Lineartronic continuously variable transmission and Subaru Symmetrical All-Wheel. The 2019 Forester is offered in standard, Premium, Limited, Touring and new Sport trim levels. 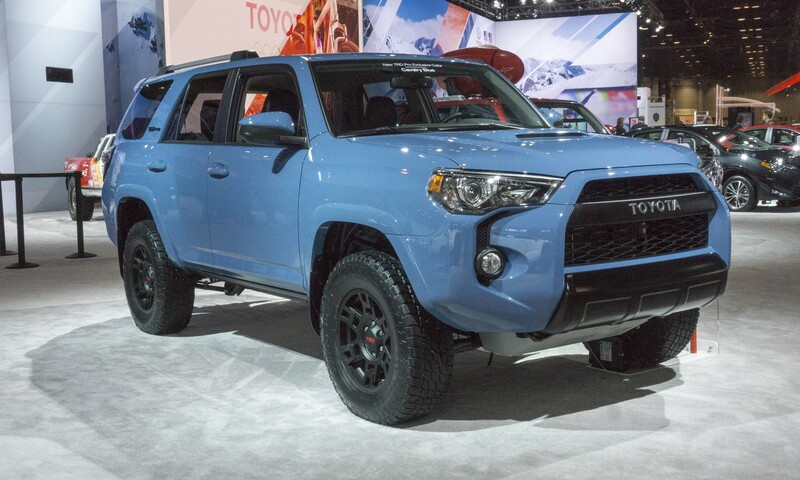 Toyota chose Chicago to introduce the 4Runner TRD Pro, which adds to its already-impressive off-road capability with specialty equipment developed by Toyota Racing Development. The TRD Pro adds 2.5-inch Fox shocks front and rear combined with a larger front sway bar and TRD-tuned front springs that provide an additional one inch of front lift. The addition of 17-inch matte black TRD Pro wheels with a different offset increase the front and rear track by nearly one inch and Nitto Terra Grappler P265/70R17 all-terrain tires for improved off-road performance. Additional equipment includes LED fog lights, black grille, projector-beam headlights with smoke trim, front skidplate with red TRD lettering and a roof rack. Inside the 4Runner TRD Pro adds a new-for-2019 standard Entune Premium JBL Audio with Integrated Navigation and App Suite as well as SofTex seats with red stitching, red TRD logos on the front headrests, TRD shift knob and TRD Pro floor mats. Toyota added to its already poplar Corolla line with the all-new Corolla Hatchback. Making its North American debut in New York, the new hatchback is lower, wider and longer than the Corolla IM it replaces, which gives the small car a more athletic stance. Overhangs in front and back are shorter which provides a sporty silhouette. The rear hatch is set at a steeper angle, adding to the sporty styling. The new hatch is available as an SE or XSE — the higher trim level setting itself apart with 18-inch alloy wheels, LED fog lights and a chrome grille surround. Powering the Corolla Hatch is an all-new 2.0-liter direct-injection 4-cylinder engine. The new powerplant is smaller and lighter than the outgoing 1.8-liter engine and delivers more power, better fuel efficiency, quieter operation and cleaner emissions. 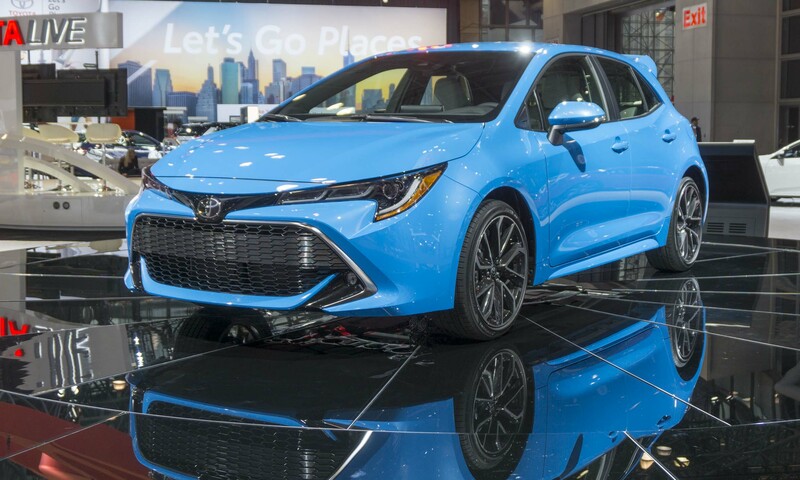 Corolla Hatchback can be set up with either an all-new Dynamic-Shift CVT with simulated 10-speed shift points and paddle shifters, or a 6-speed manual transmission. A few weeks before the L.A. Show, Toyota provided a sneak peek at the all-new 2020 Corolla. At the show Toyota followed up with the hybrid version of this best-seller. Surprisingly, this is the first-ever hybrid version of the Corolla, which will use the latest version of Toyota’s Hybrid Synergy Drive from the new-generation Prius. This is now possible thanks to Toyota’s new global architecture. There won’t be many visible differences between the hybrid and non-hybrid Corolla, but the hybrid will ride on dedicated 15-inch aluminum-alloy wheels fitted with low-resistance tires. 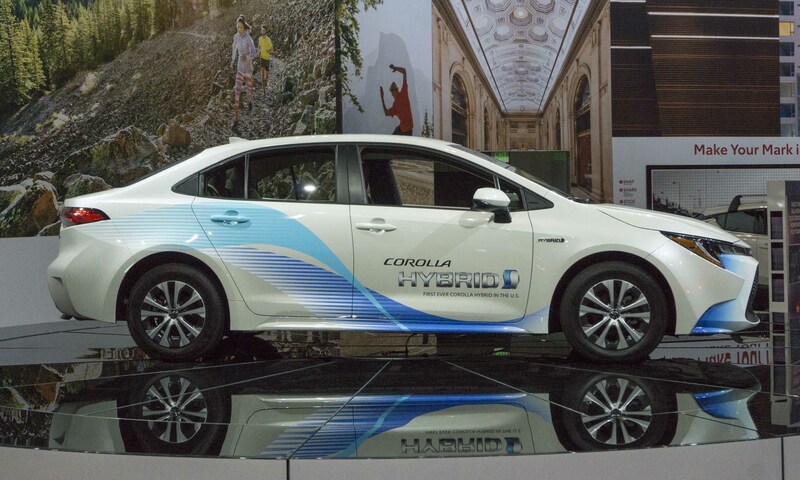 The Corolla Hybrid will be powered by a 1.8-liter 4-cylinder engine teamed with two electric motors and an electronically-controlled continuously variable transmission to deliver a combined 121 horsepower. While this doesn’t seem like much power, on acceleration from a stop the electric motors will provide a small boost that should make the new Corolla feel a bit quicker. Although it hasn’t been tested yet by the EPA, Toyota is predicting the Corolla Hybrid will achieve more than 50 mpg when it arrives in showrooms next spring. 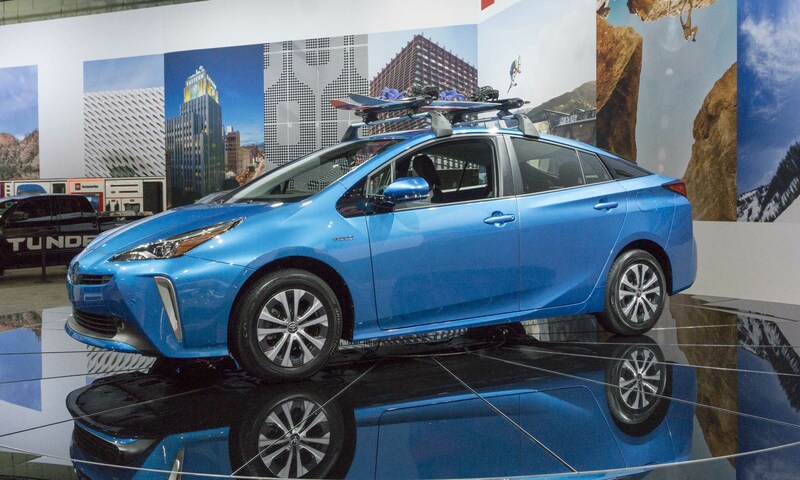 Toyota’s groundbreaking Prius hybrid has been and continues to be one of the most fuel-efficient vehicles in America, and for 2019 the Prius become one of the most fuel-efficient all-wheel drive models. The new AWD-e system uses an independent electric motor on the rear axle that will power the rear wheels from zero to 6 mph to improve launch in slippery conditions — when needed the motor will engage at speeds up to 43 mph. The new Prius AWD-e also gets updated styling which will carry through to the rest of the Prius lineup. The Prius AWD-e uses the same Hybrid Synergy Drive system as the rest of the Prius lineup, consisting of a 1.8-liter 4-cylinder engine teamed with two motor/generators to produce a total of 121 horsepower. With expected fuel economy numbers of 52 mpg city / 48 mpg highway / 50 mpg combined, Toyota believes the all-wheel drive Prius will make up about 25 percent of Prius sales. Like the rest of the Toyota lineup, the Prius AWD-e will have the Toyota Safety Sense suite of high-tech safety features as standard equipment, which includes pre-collision braking and lane-departure alert with steering assist. The all-new 2019 Toyota RAV4 made its world debut at the New York Auto Show, boasting a new tougher, more aggressive design. 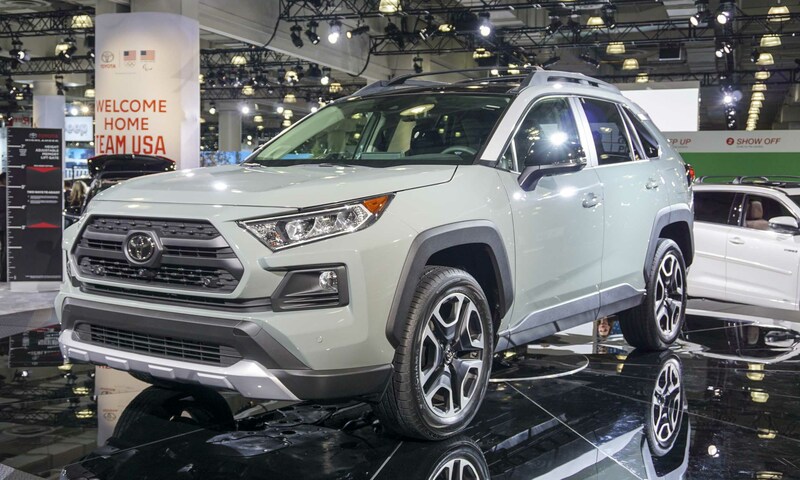 The new look — particularly the stronger front end — bears more resemblance to the 4Runner (Toyota’s legendary off-road SUV) than the previous-gen RAV4. The fifth generation RAV4 is built on a new platform with multilink rear suspension and the new unibody is 57 percent stiffer than the previous model, allowing engineers to tune the chassis for better handling, ride comfort and lower interior noise. Toyota Safety Sense 2.0 with new active safety technologies is standard as well as Entune 3.0 with Wi-Fi Connect powered by Verizon, Amazon Alexa, and Apple CarPlay Compatibility. Two powertrain choices are offered for the 2019 RAV4: a Dynamic Force 2.5-liter inline 4-cylinder engine or the Dynamic Force 2.5-liter inline 4-cylinder Toyota Hybrid System II (THS II) engine with electronically-controlled continuously-variable transmission. For true off-road capability, available Multi-Terrain Select is now offered, as well as a new dynamic torque vectoring all-wheel drive with rear driveline disconnect. Based on the already-capable Tacoma TRD Off-Road trim, the Tacoma TRD Pro adds 2.5-inch Fox shocks front and rear, combined with a larger front sway bar and TRD-tuned front springs that provide an additional one inch of lift. Tacoma TRD Pro is equipped with 16-inch TRD Pro black alloy wheels that increase the track by one inch, wrapped with P265/70R16 Goodyear Wrangler Kevlar All-Terrain tires. Additional equipment includes a new front skidplate with red TRD lettering and a cat-back TRD exhaust with a new Black Chrome tip. 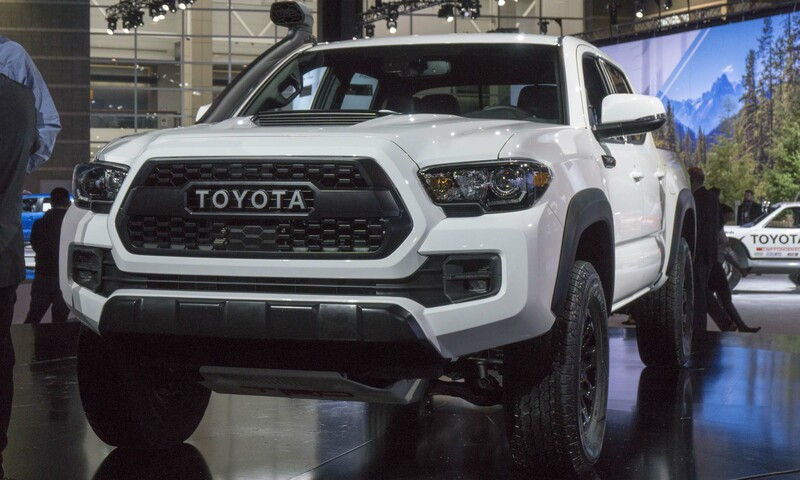 Exterior features include a black grille, projector-beam headlights with black sport bezels, LED Daytime Running Lights, Rigid Industries LED fog lights, taillights with black sport bezels, and TRD Pro badges. The most obvious new feature on the Tacoma TRD Pro is an available TRD Desert Air Intake, designed for better performance by providing cleaner intake air in dusty, dirty off-road conditions. 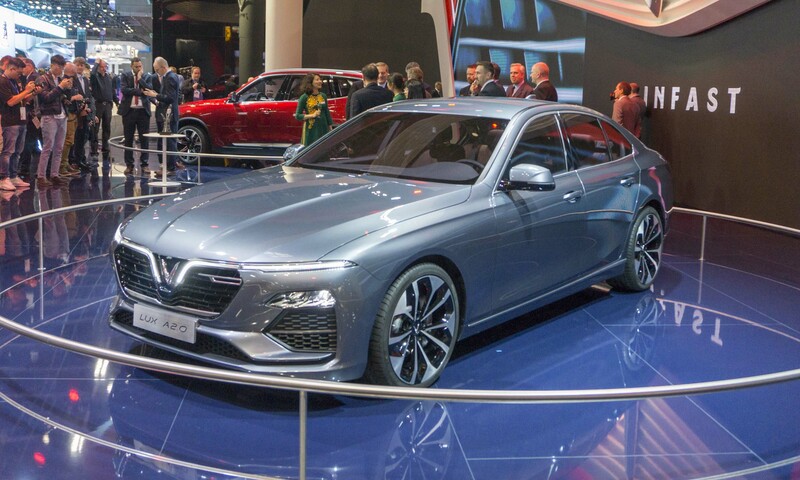 The first volume automobile manufacturer from Vietnam, VinFast debuted as a manufacturer at the 2018 Paris Motor Show with the world premiere of two new vehicles: the LUX A2.0 sedan and the LUX SA2.0 SUV. According to VinFast, the company aims to become southeast Asia’s leading vehicle producer, developing and manufacturing vehicles in Vietnam with the goal of selling cars throughout the world. A state-of-the-art production facility has been completed at Hai Phong in northern Vietnam following an investment of US$1.5 billion, and sales are scheduled to begin in Vietnam in summer 2019 — a mere two years after the company was formed. VinFast has worked with Pininfarina to further develop designs that are Vietnamese in character with an Italian flare. The resulting vehicles were on display in Paris — the LUX A2.0 sedan and LUX SA2.0 SUV. No word if these vehicles are coming to America anytime soon. 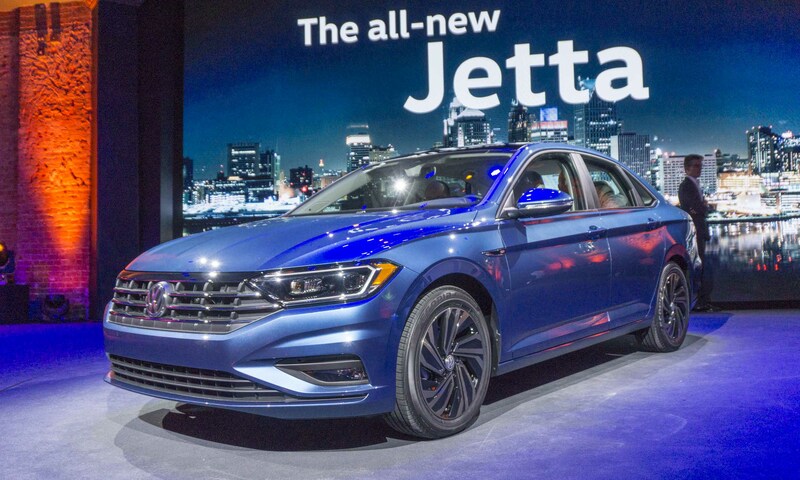 The Jetta is Volkswagen’s best-selling model, so introducing a new version of this small sedan is a big deal. Built on a completely new platform, the Jetta features a sleek coupelike design that gives it a sporty look. Redesigned headlights with signature LED running lights are nicely integrated into the wide grille, creating a seamless line across the front. A sculpted hood adds to the sportier appearance. Larger than the outgoing version in nearly every dimension, the Jetta is built on a new platform with a lengthened wheelbase. The car is longer, wider and taller, which not only gives the Jetta a new look, it translates into a more spacious cabin. The Jetta’s interior has been completely redone with a nicely integrated touchscreen display as well as available heated and cooled leather seats. Depending on trim level, the Jetta’s interior can be customized with a choice of ambient lighting color as well as Volkswagen’s Digital Cockpit display, which gives the driver freedom to configure the information placed front and center. 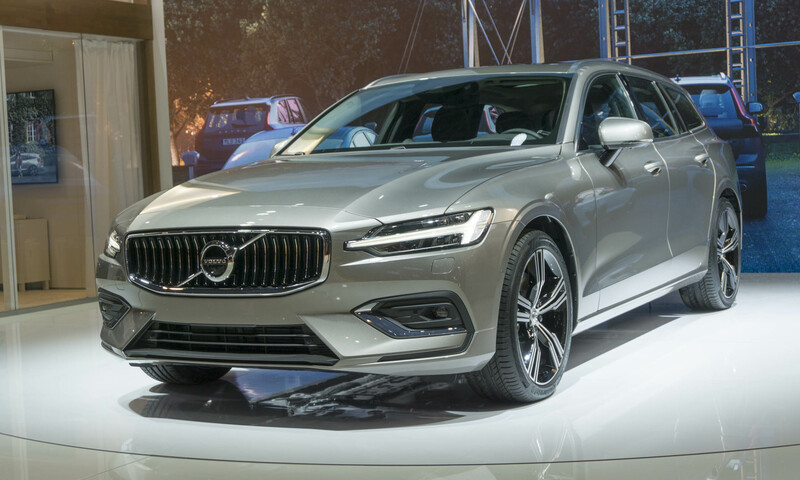 Volvo debuted its latest wagon at the 2018 Geneva Motor Show, following the debut of the larger V90 wagon last year. More substantial than the outgoing V60, the new model offers a more spacious interior, higher levels of luxury and the latest technology designed to enhance the driving experience as well as increase safety levels. As expected with any new vehicle emanating from Volvo, the V60 will come well equipped with the latest safety features. This includes City Safety, which uses autobraking and sensor systems to avoid potential collisions, as well as detect and recognize pedestrians, cyclists and large animals. Two powertrains will be available for the V60 in the U.S., matching those found in the XC60. The T5 will get a 2.0-liter turbocharged engine producing 250 horsepower, while the T6 gets a supercharged and turbocharged 2.0-liter engine generating an impressive 316 horsepower. The T6 will also come with Volvo’s all-wheel-drive system.